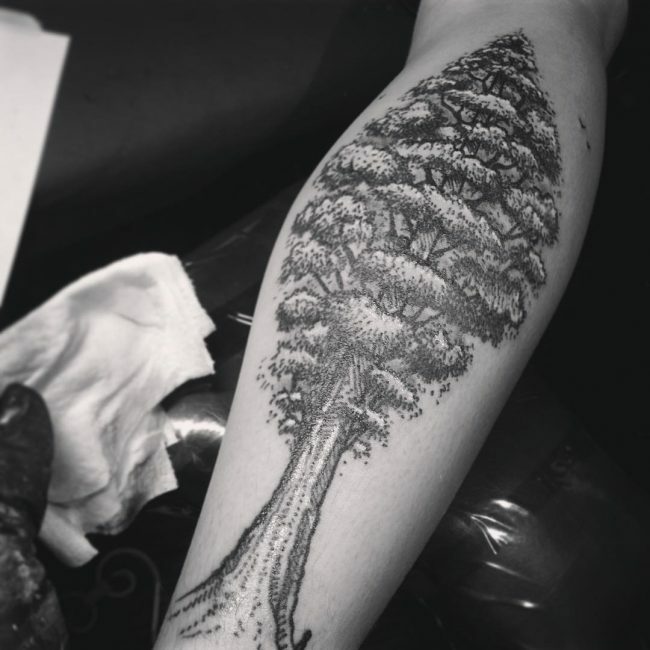 Tree tattoos have seen a noticeable comeback in recent times, and they have become increasingly popular among men and women. 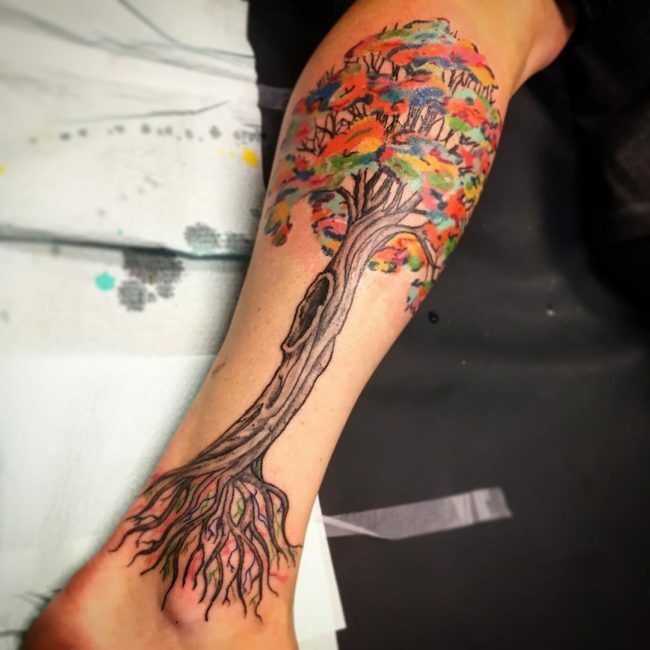 But in order to fully understand the meaning and significance of tree tattoos, you have to retrace and rediscover their histories among different cultures, and what these trees symbolize to each one. 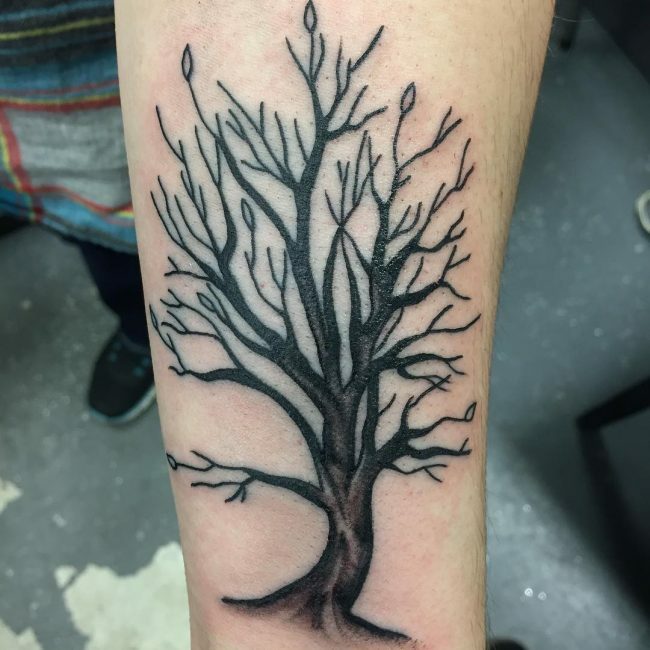 Since the beginning of time, trees have been seen as a symbol of the origin of life and have been used by many as a means of retracing life and families. 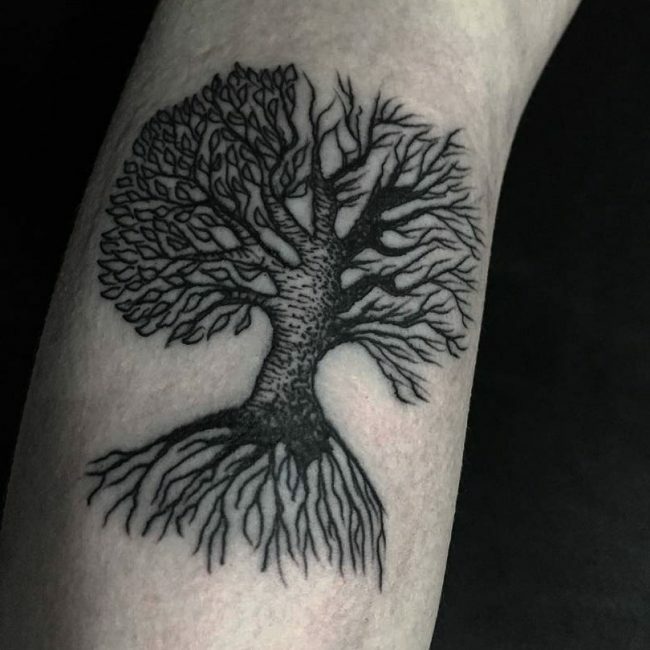 It can even be said that trees represent life, and this is why they have been so respected in many communities. 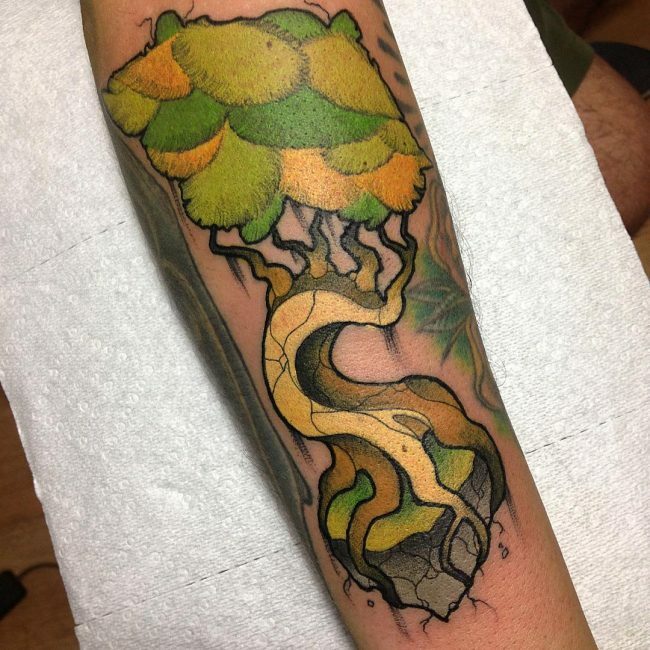 Trees are seen as long-lasting, flexible, and strong due to their ability to survive and thrive for long periods of time. 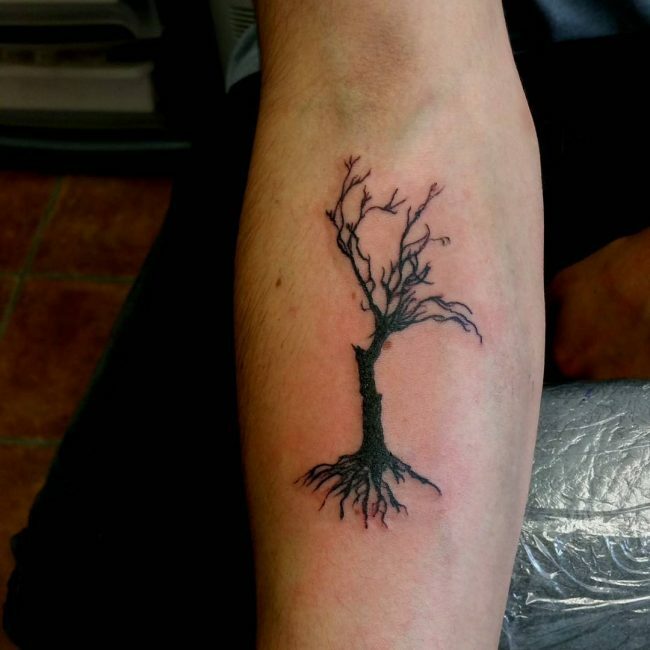 Their resilience and survive-ability has thus made a sign of strength and adaptability to many societies. 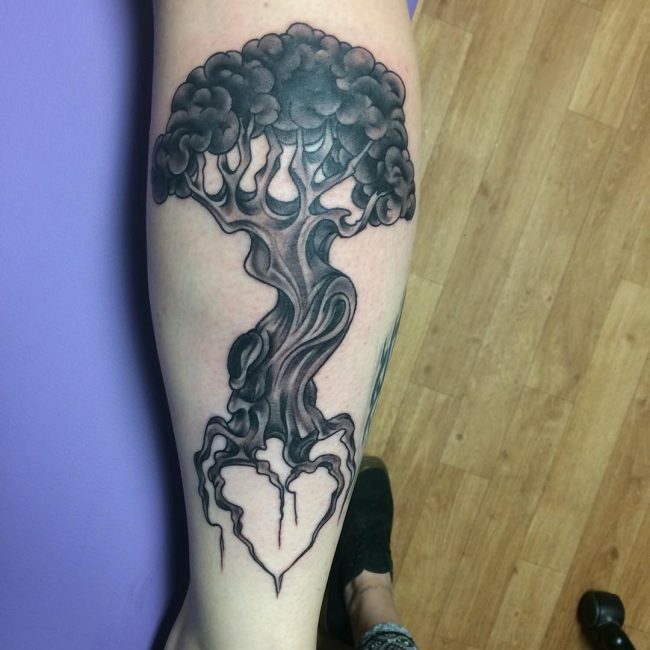 Trees are often also considered symbols of caring and wisdom due to their many uses. 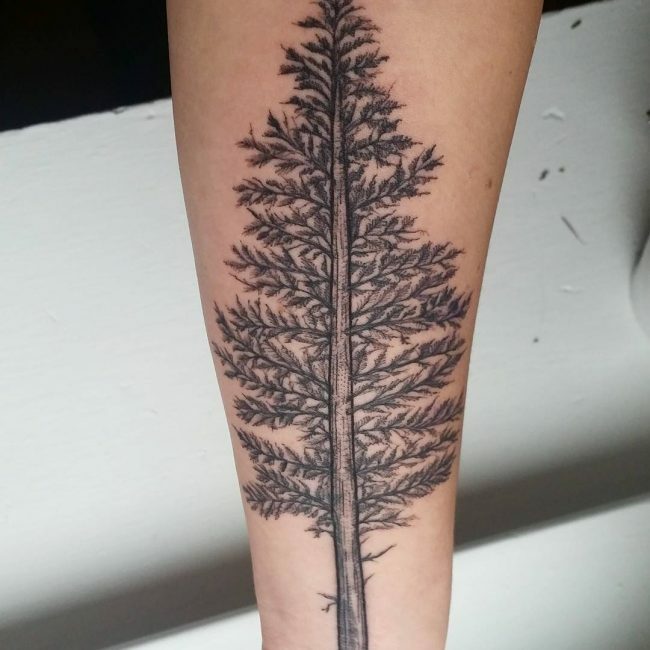 They provide safety to different creatures that live on their branches and within their crevices, and provide shelter to communities and tribes that use them as lumber. 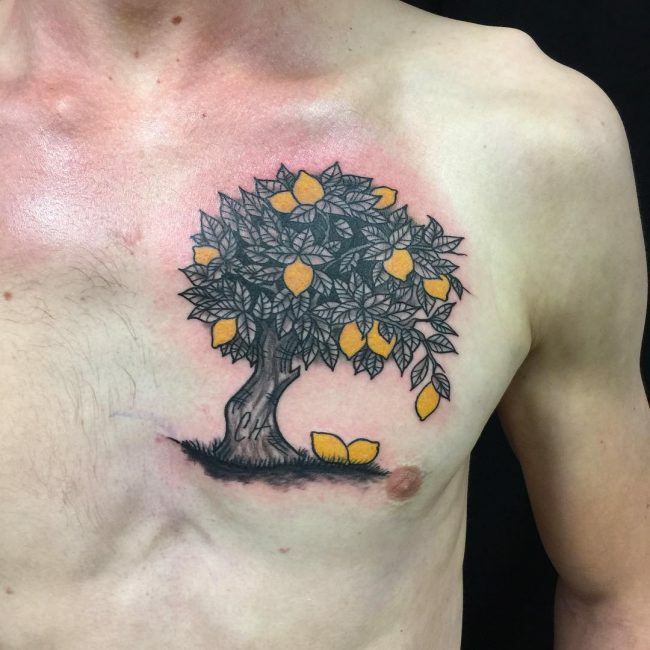 Many trees even provide different kinds of fruit, some of which can even be made into medicine for a wide variety of cultures. 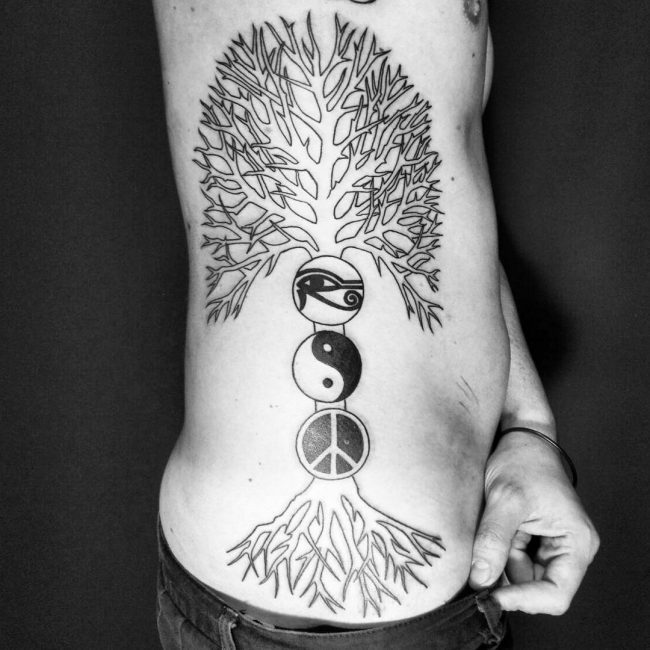 Their nutritional and medicinal importance have led to accumulated layers of meaning and significance. 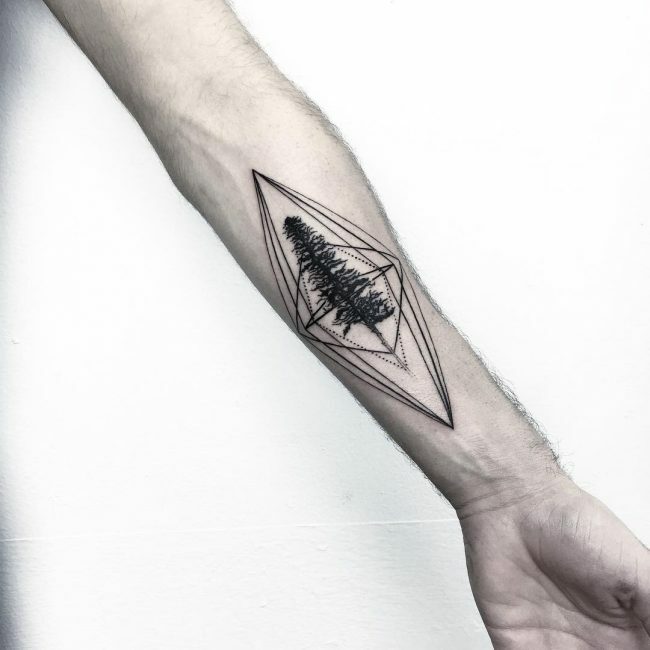 These magnificent forms of nature were even revered by the ancient Celts and Greeks, considered frequently to be sacred or divine. 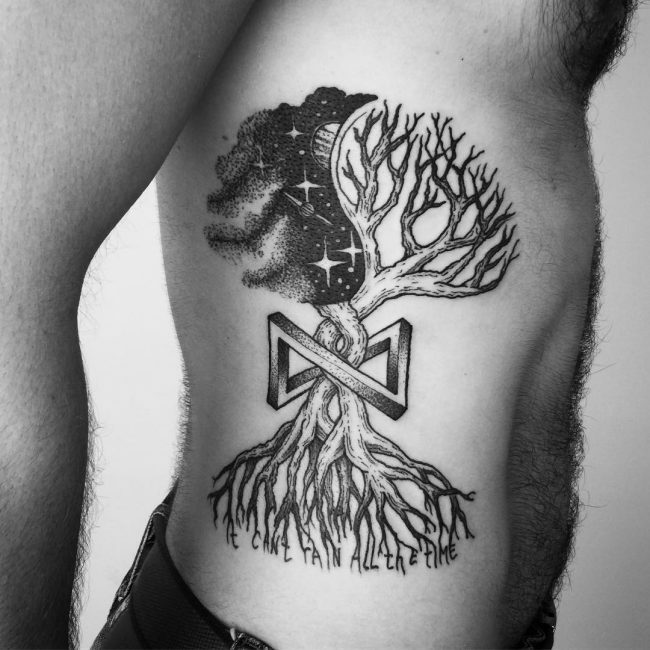 The Celts even believed that trees possessed special powers and were guardians who held great wisdom. 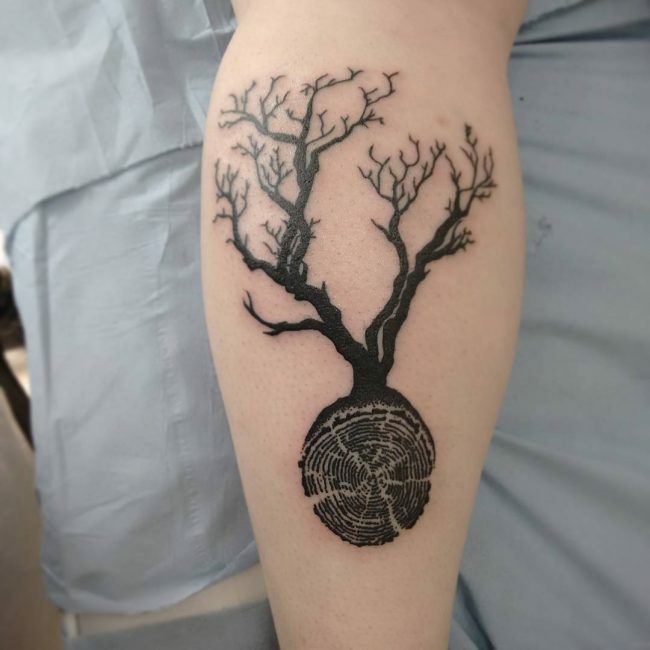 This is in part due to the nature of the Celts, who spent their lifetimes surrounded by nature, and as such, begin to see themselves represented in the world around them. 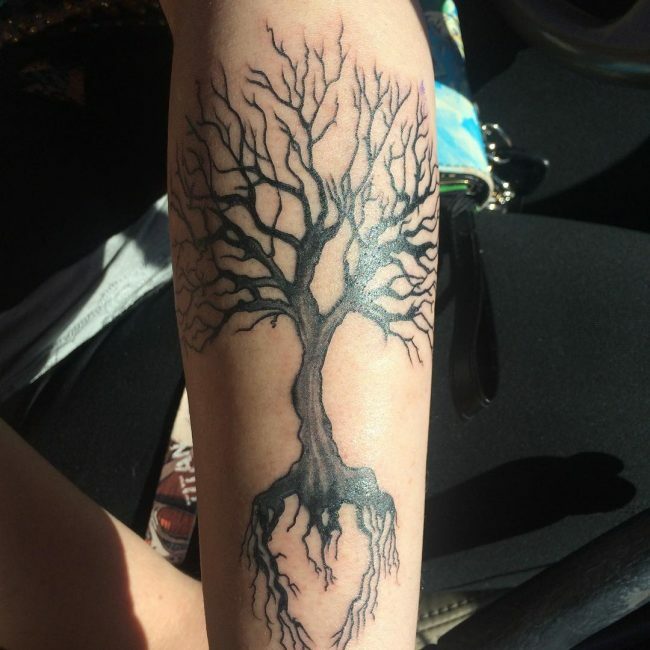 As a society, however, we still have a tendency to view trees as a symbol of something higher and more powerful. 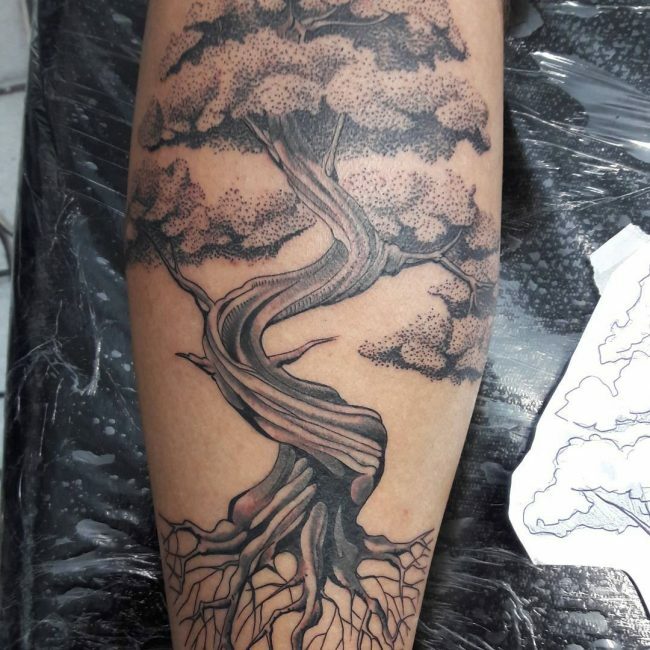 For example, we find meaning and poetry in a tree’s reach towards the sky in order to seek out light, which can be symbolic of us as humans reaching towards success through growth. 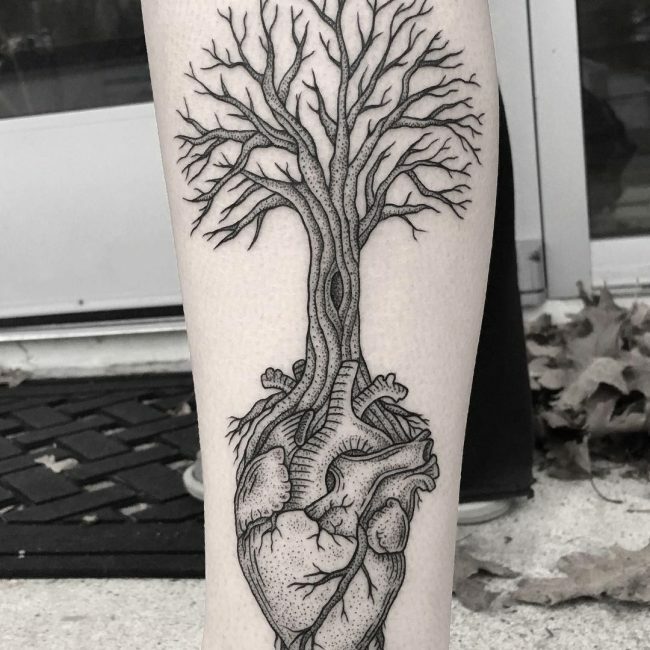 But in order to grow, a tree must have a strong trunk – thought of as a hard backbone in humans, meaning dedication, hard work, and experience – and tough roots – which, in human terms, in synonymous with having an excellent foundation. 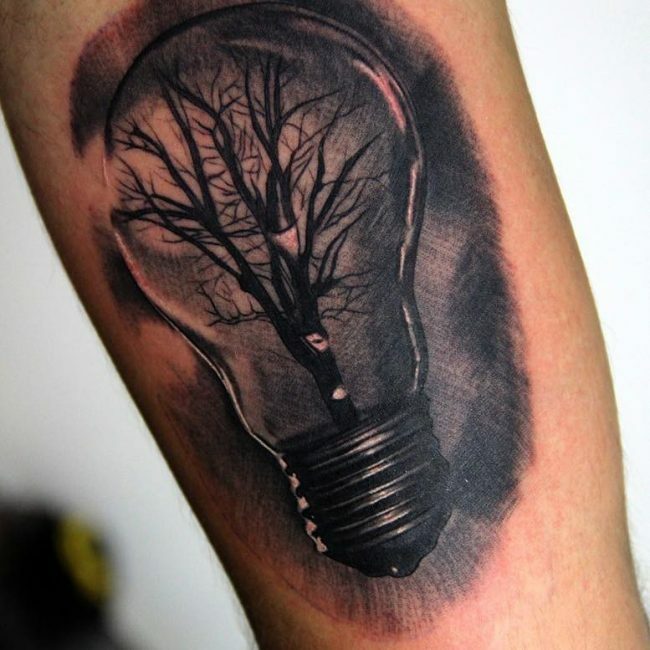 The sprouting of flowers and fruits can then be perceived as our success, making a tree a complete symbol of life. 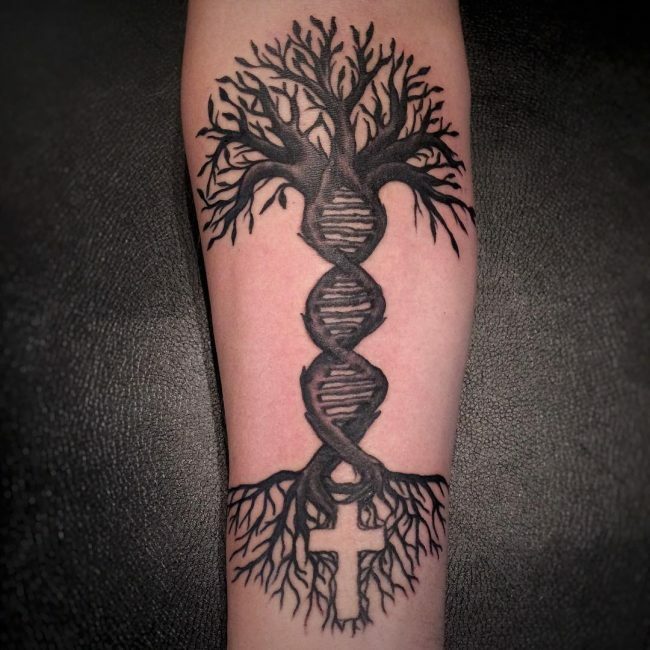 The mythology of this tree of life isn’t hard to seek out and discover. 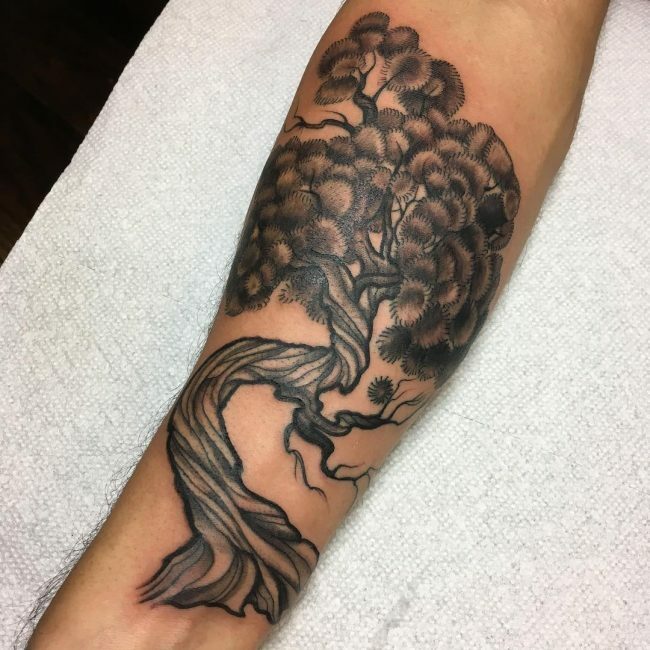 There are many philosophies, cultures, histories, and denominations that speak of trees, although the meanings of each individual design vary. 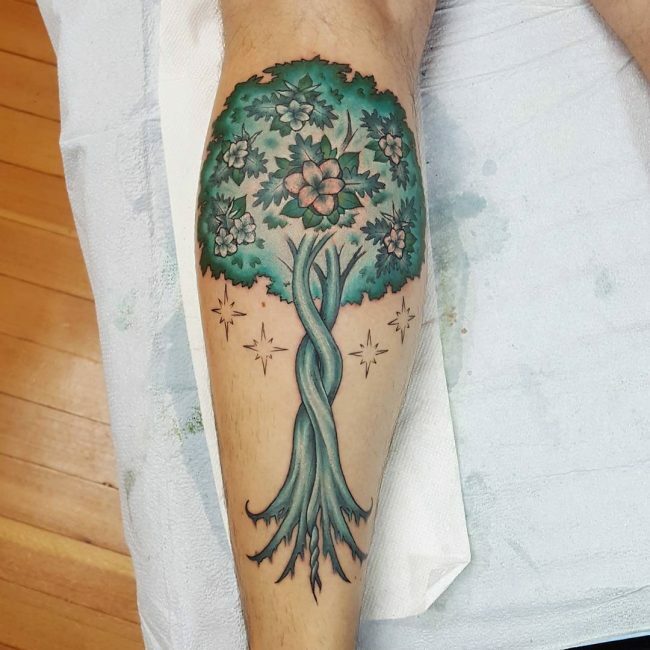 Some areas refer to popular tree designs as the tree of knowledge, the sacred tree, the cosmic tree, or the world tree. 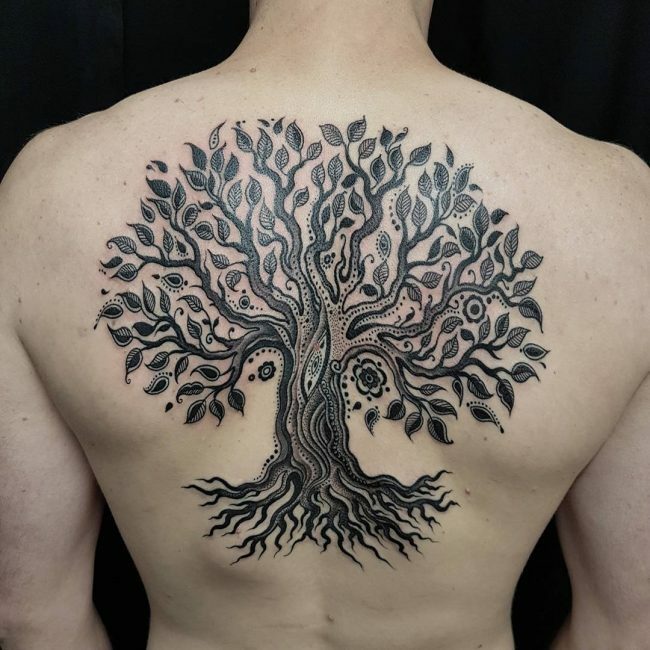 It has been known as the sacred tree, tree of knowledge, the world tree, or the cosmic tree, and serves as an advert to the way that living things are interconnected. 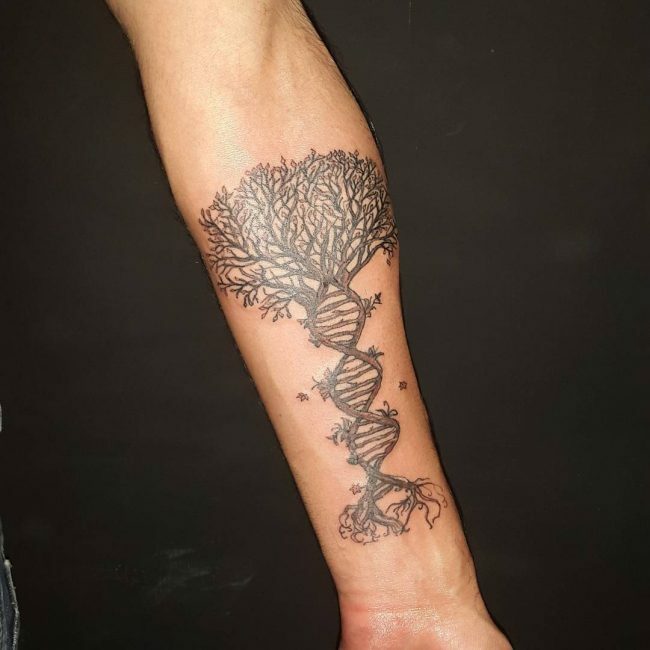 If you think about it, it is almost like a metaphor that states how we all originate from the same source of life. 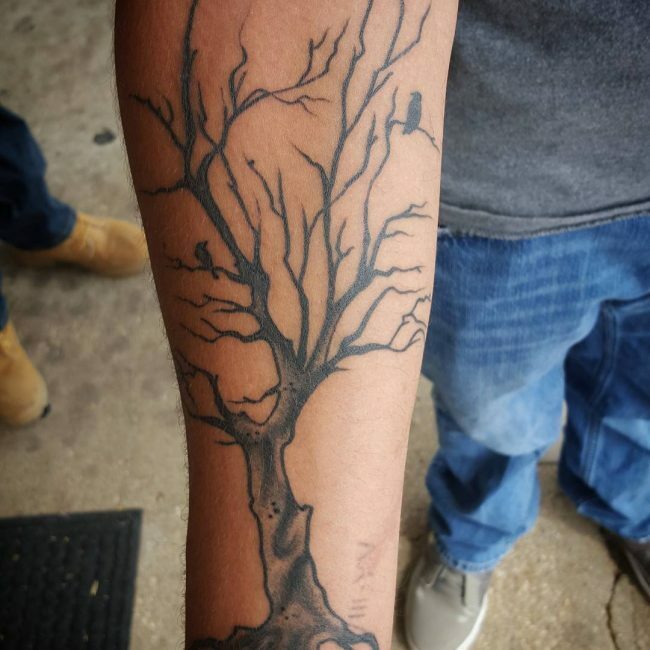 A tree can be a symbol of everlasting eternity and immortality. 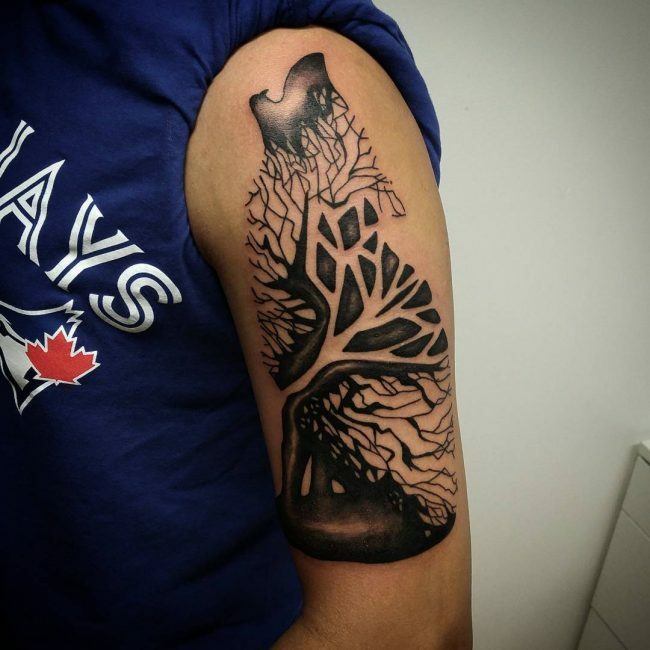 In can represent wisdom or knowledge. 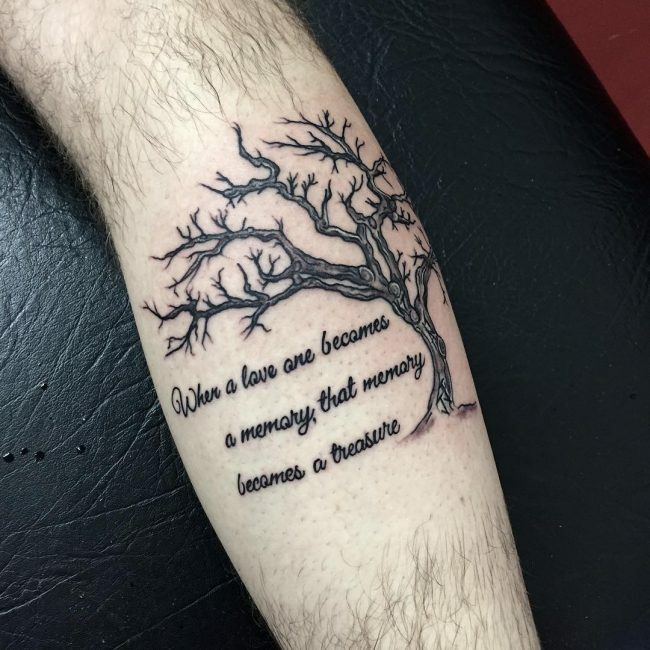 It can speak of finding salvation and forgiveness from past mistakes. 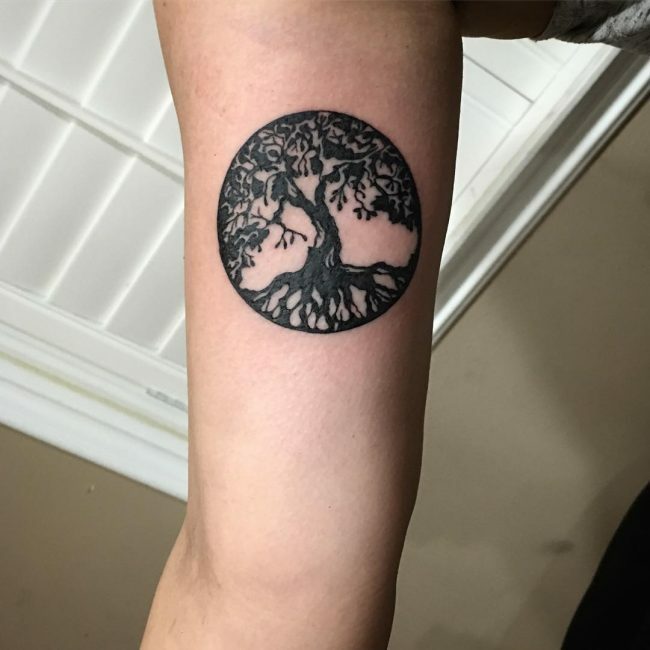 It can be a metaphor for protection and strength, and it can even be a representation of the wealth and rush that comes with growth. 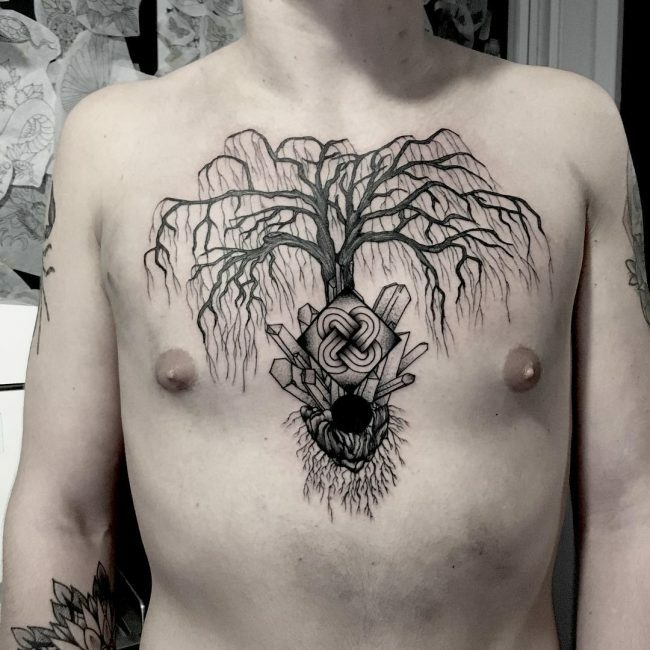 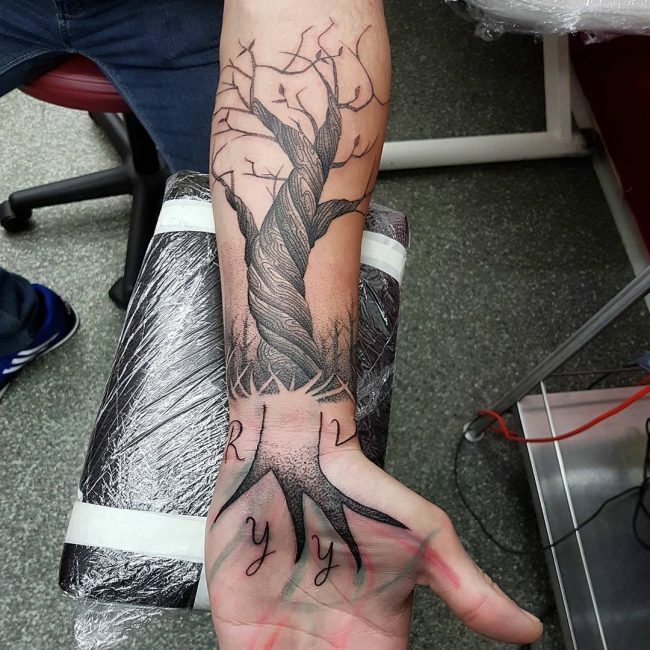 In many tree tattoos, the tree is drawn with its roots and branches intertwined in a circle. 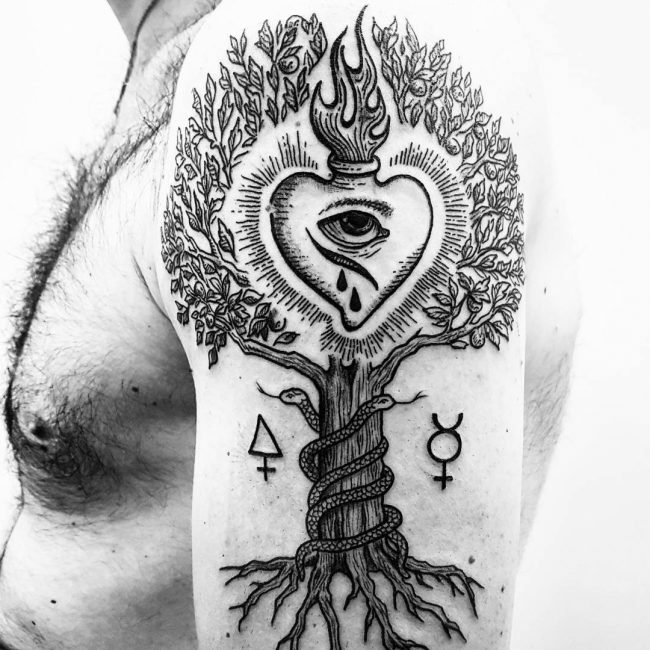 While we talk about the meaning and design of these tattoos, it is highly important to understand and familiarize ourselves with the meaning of certain parts of the tattoo. 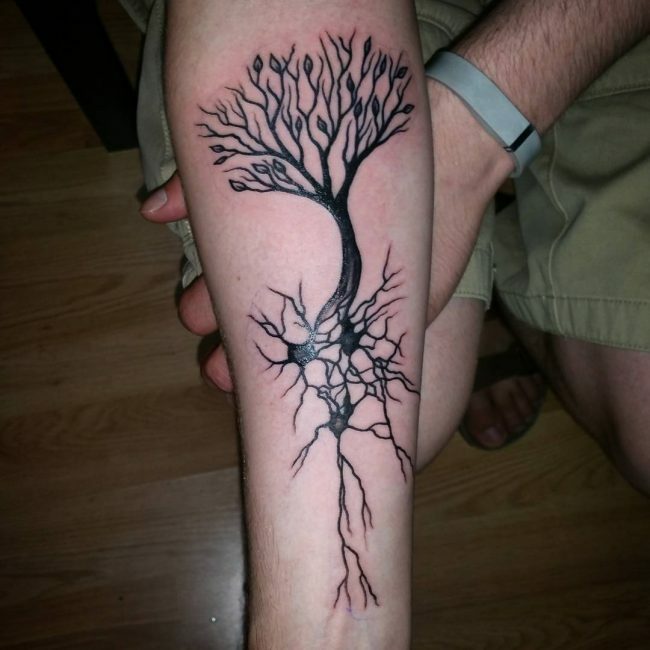 This includes the leaves, roots, branches, and flowers. 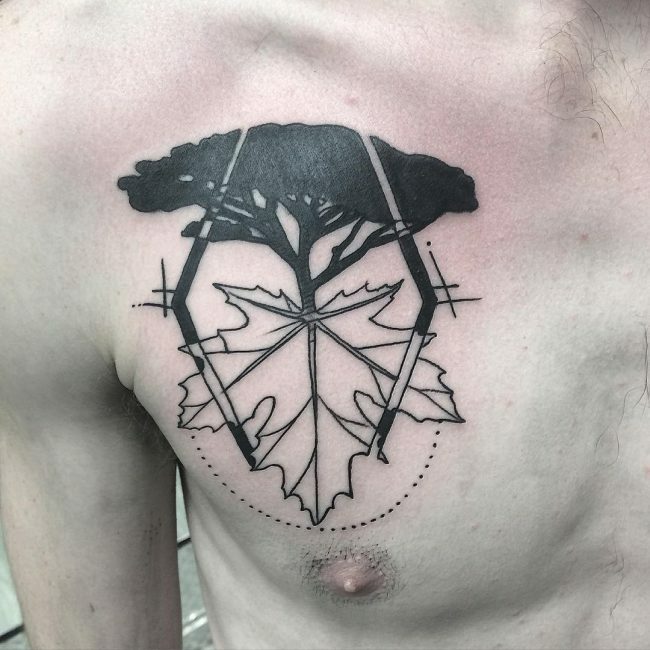 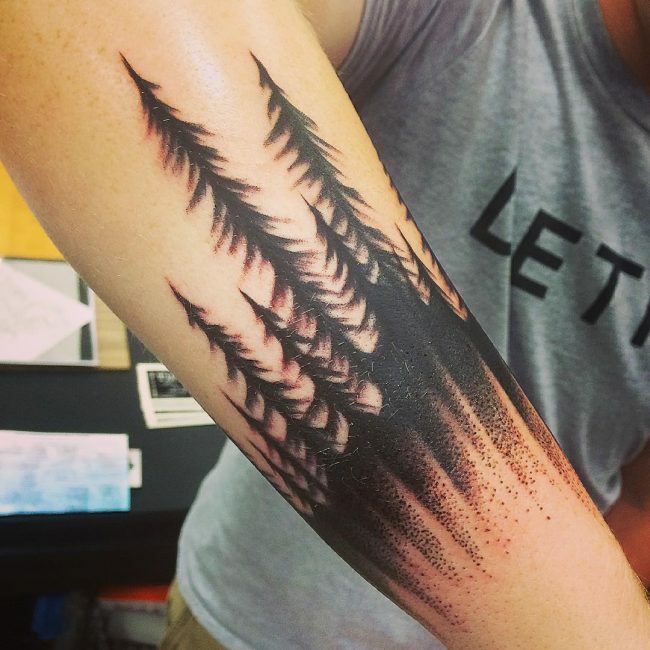 In tree tattoos, leaves can have a wide range of interpretations. 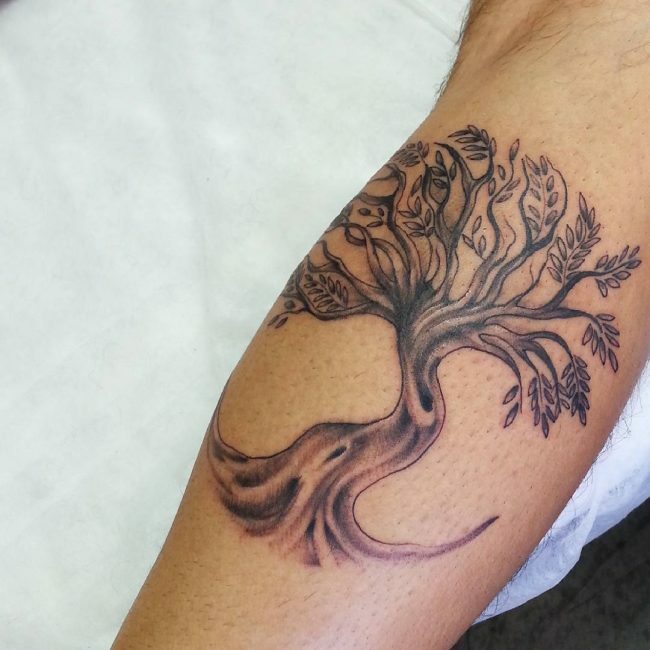 To some, it symbolizes growth and rebirth because trees get new leaves every year. 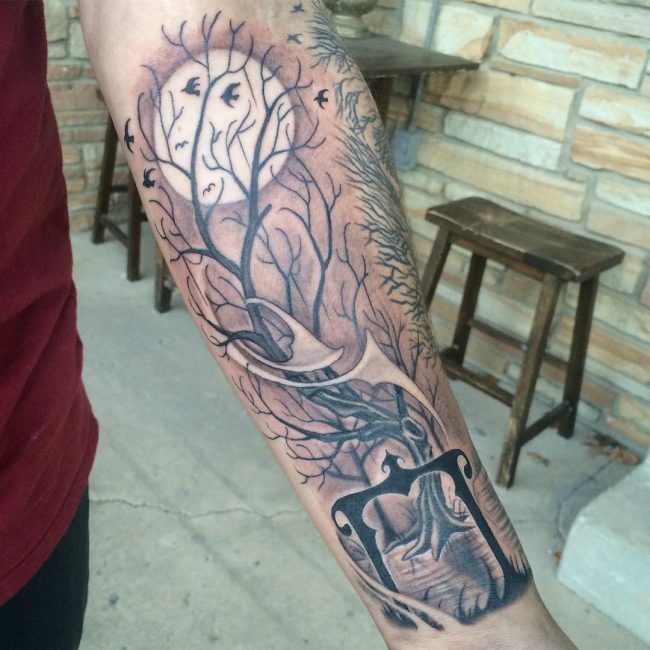 To others, it may stand for impermanence and things that fade. 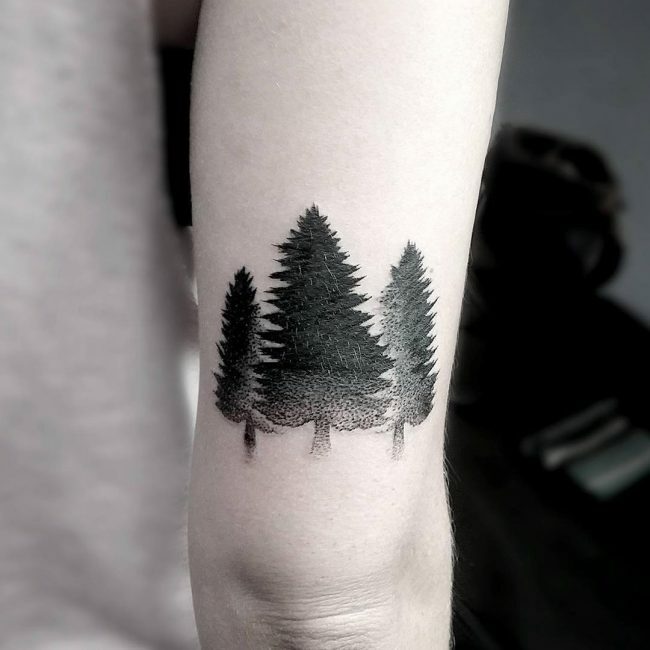 In this contrast, the sizes and colors of the leaves matters; fresh young leaves are mostly used to represent new growth, while the older or mature leaves may symbolize an accumulation of years. 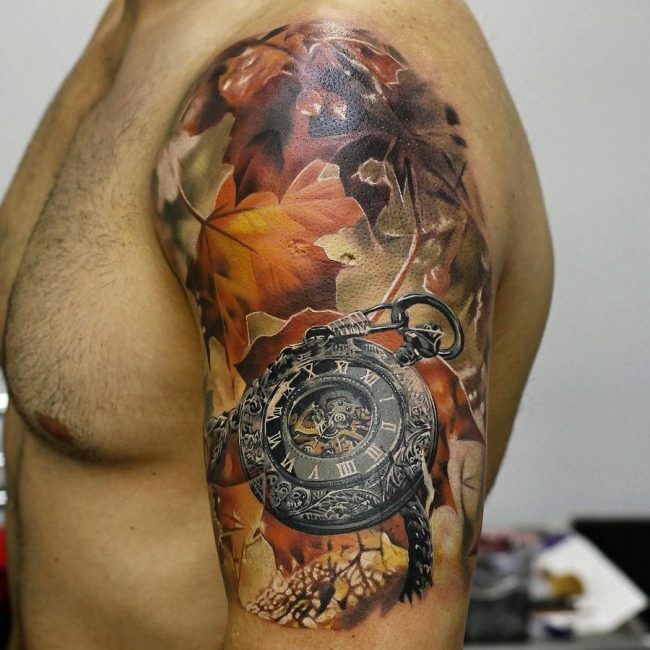 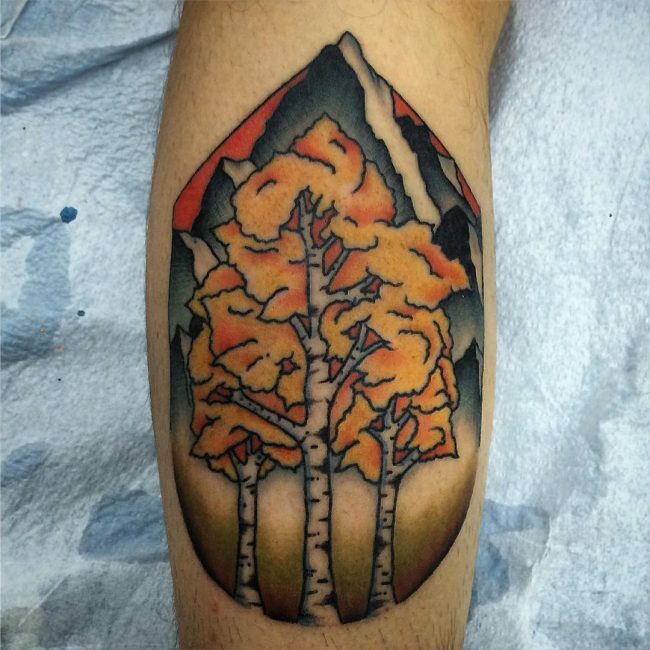 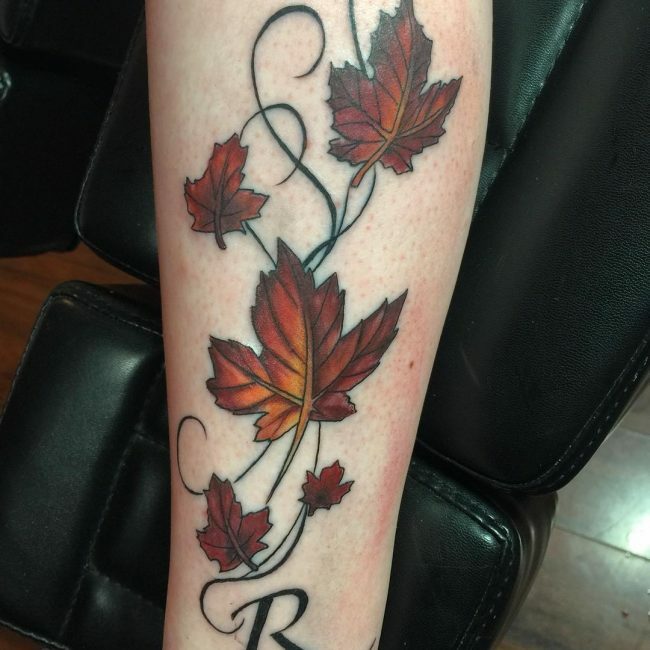 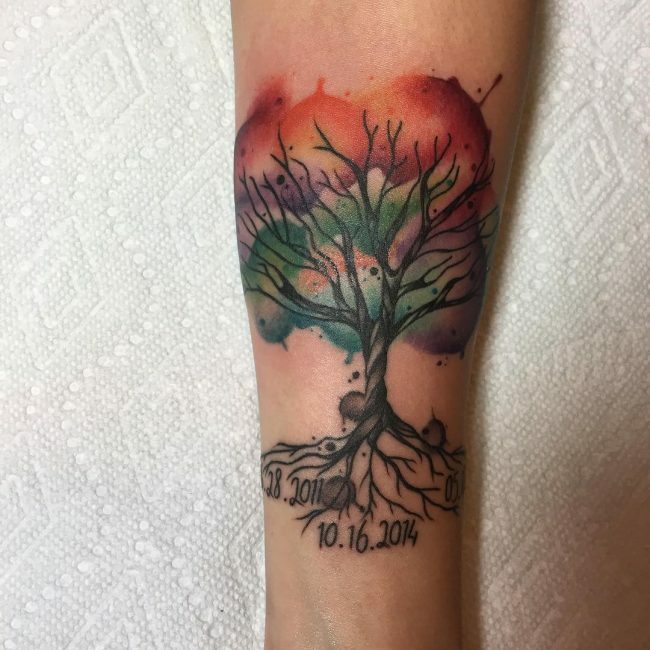 In certain tattoos, the use of fall colors reflects maturity and growth, whereas the presence of decaying leaves in a tattoo can symbolize death. 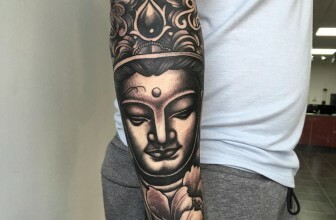 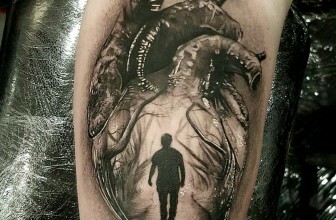 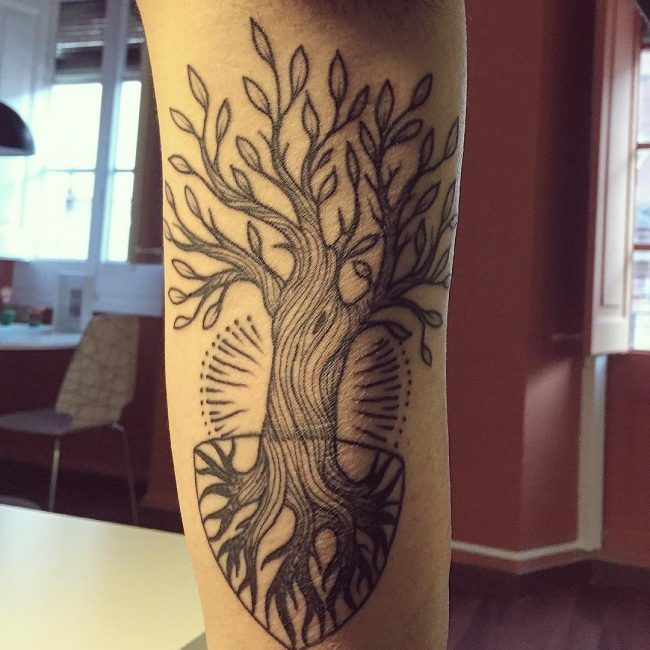 The roots, on the other hand, symbolize that the tattooed person is very connected to his or her past, history or family. 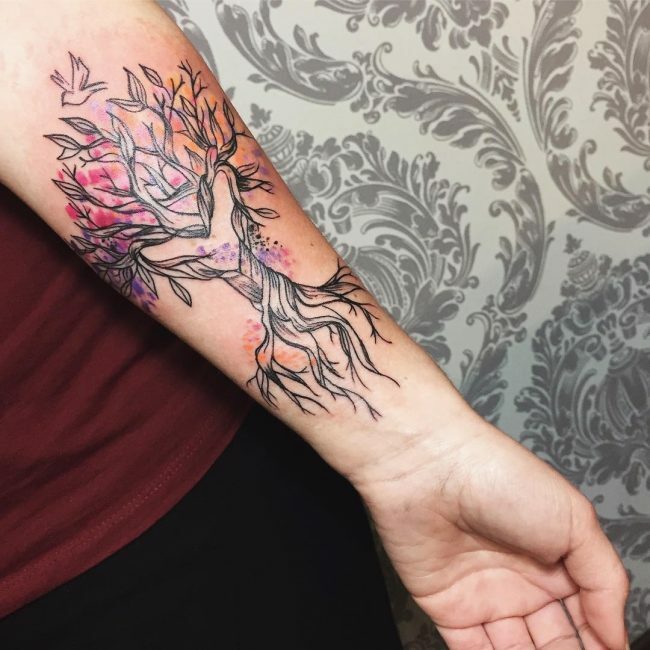 Meanwhile, flowers can represent a blossoming in both the literal and/or figurative sense, especially when referring to a woman. 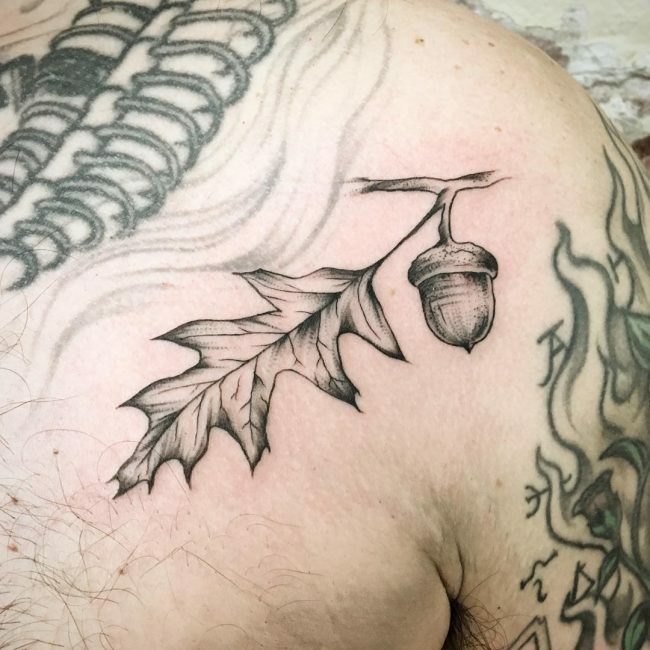 It sometimes represents a sexual awakening. 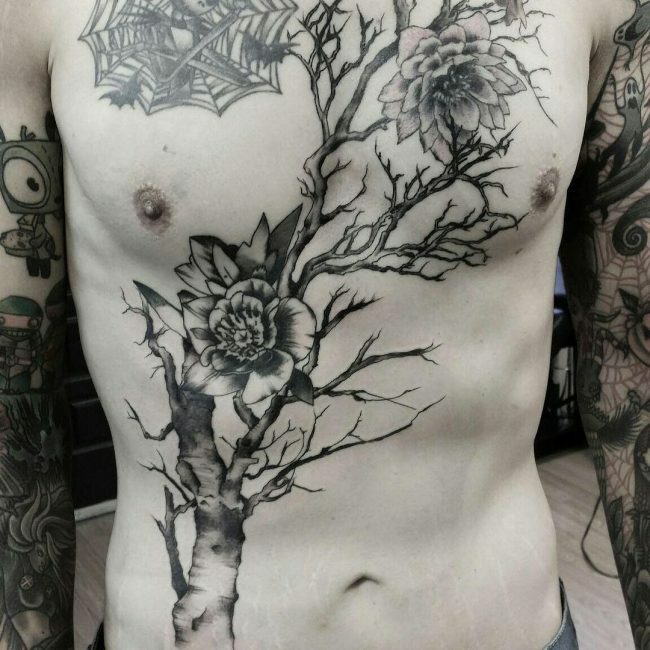 Flowers also represent virginity, tranquility, innocence and youthfulness in general. 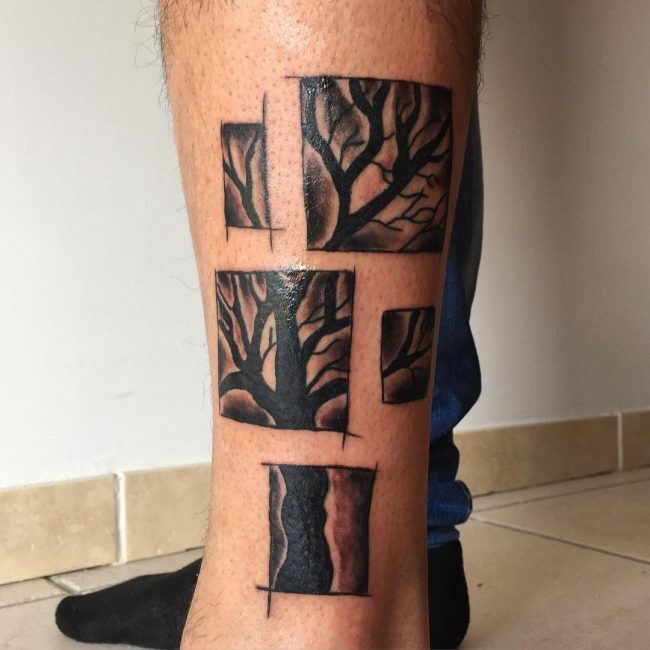 In summary, many people use the tree to symbolize different stages of life. 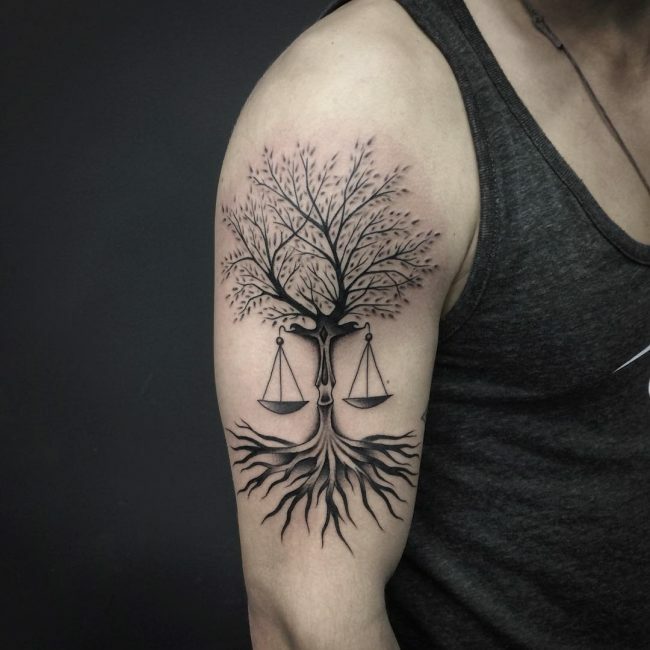 As such, a tree with buds symbolizes youth, trees with flowers may symbolize adolescence, and the one with fruits represents maturity. 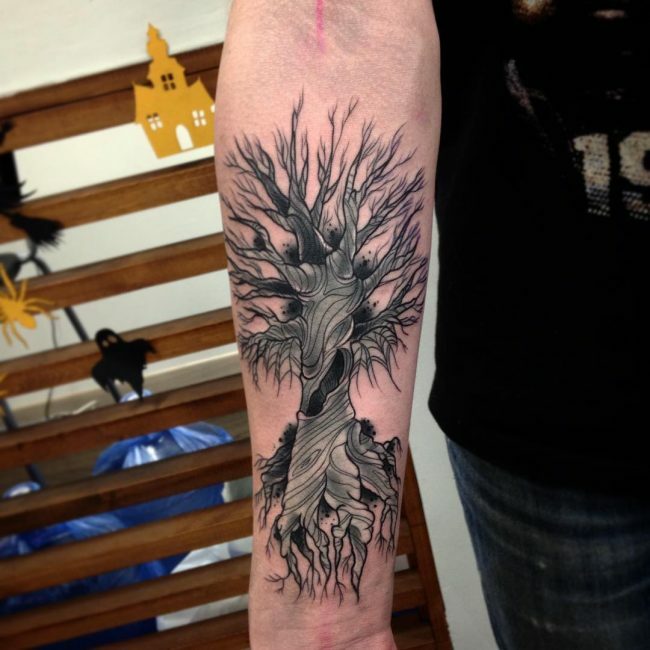 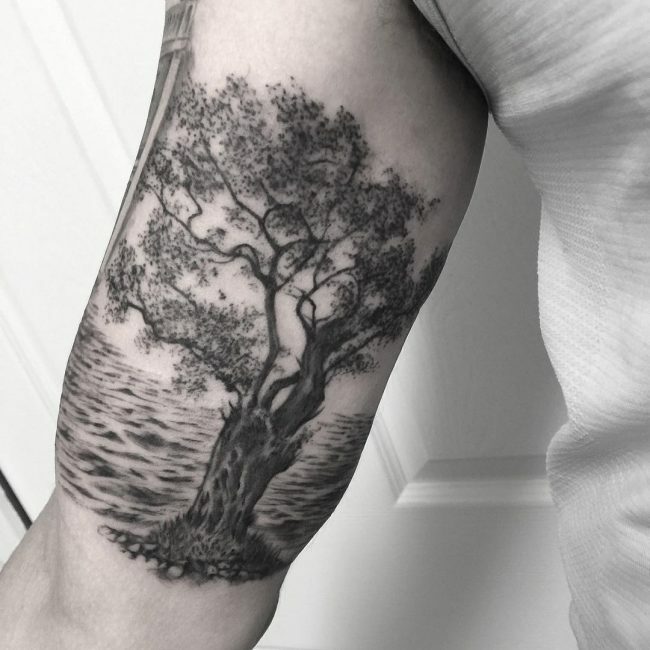 Tattoos of leafy trees with roots represent experience, maturity and the very strength of the human being. 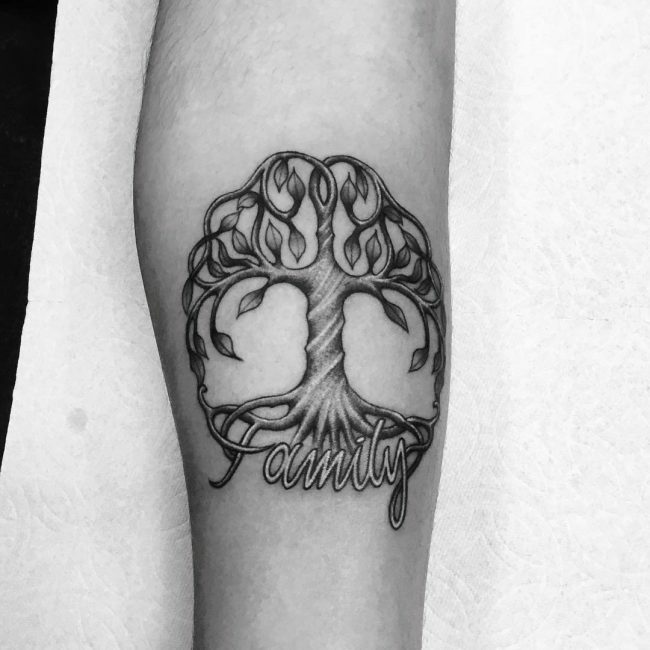 They are a symbol that shows that the wearer is focused, has grown, and is strong enough to endure whatever life chooses to throw at them. 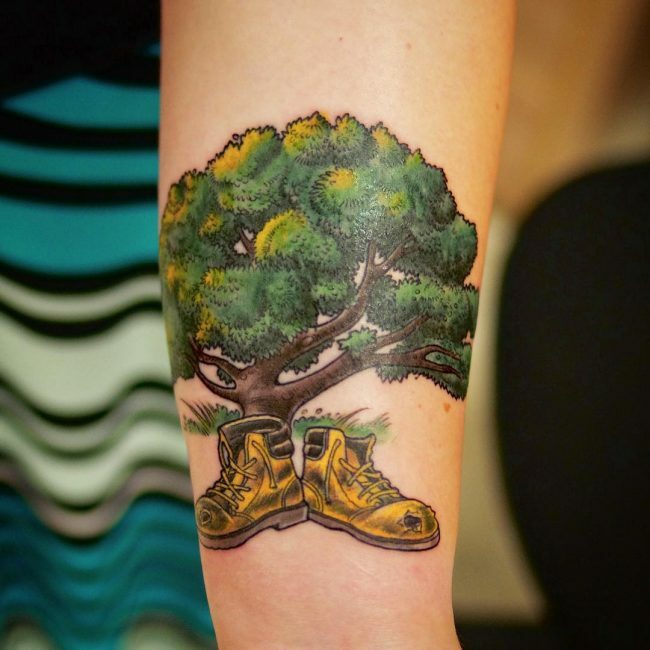 The choice of placing a tattoo is very important, as it can carry a very special significance. 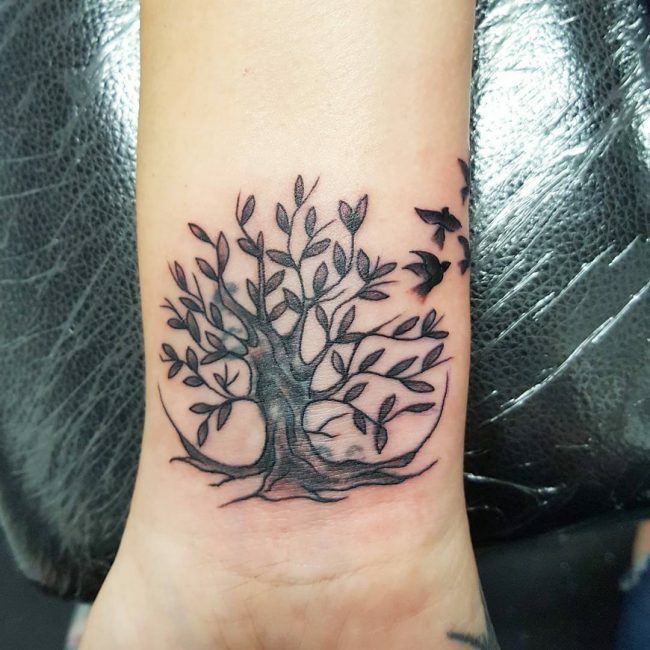 In the same way that the meaning of a tattoo can vary from person to person, where you place your tattoo is your personal decision. 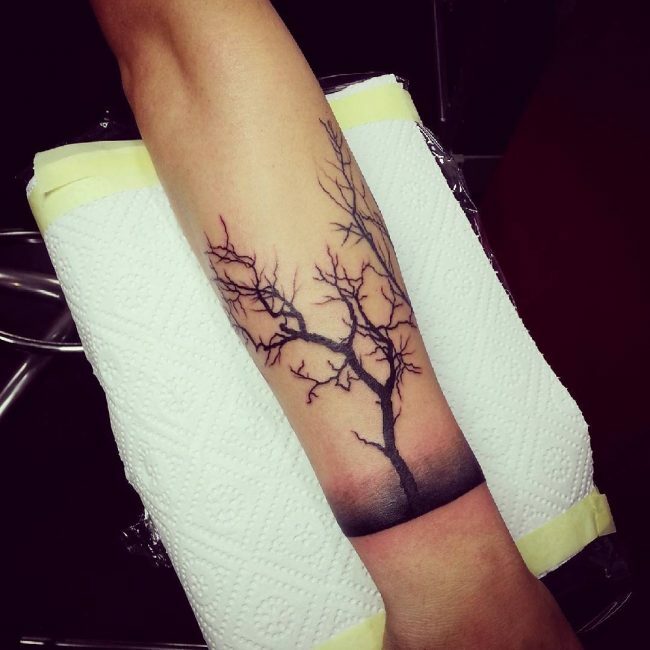 Color and size are also important and come into play when interpreting a tattoo’s placement. 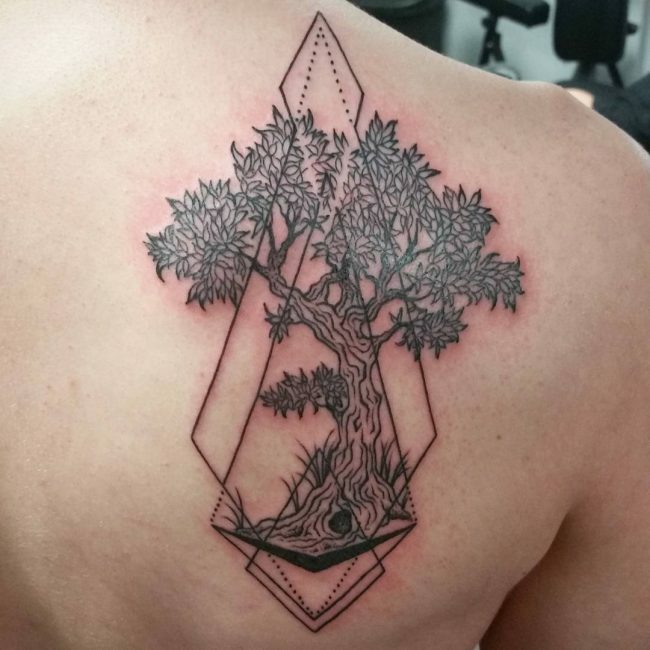 If you aim for a large piece, your back may just be the perfect placement. 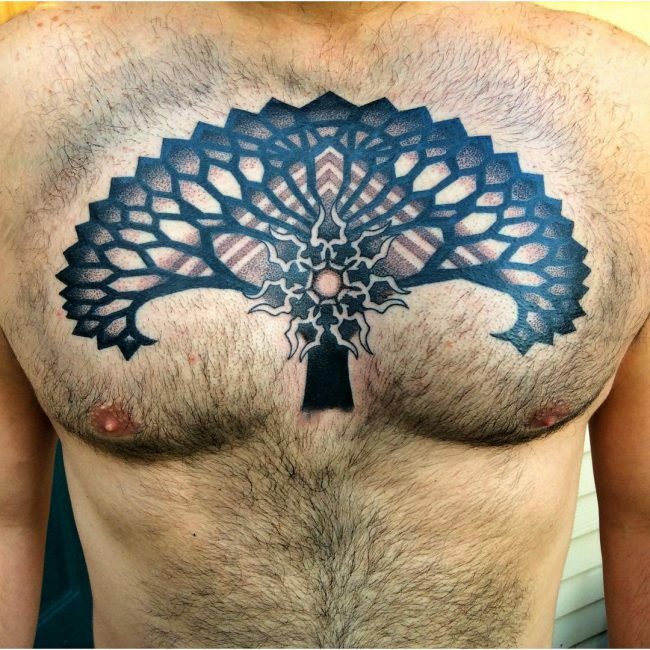 Women often choose to have this tattoo on their breasts, and men most times have theirs on their upper arm. 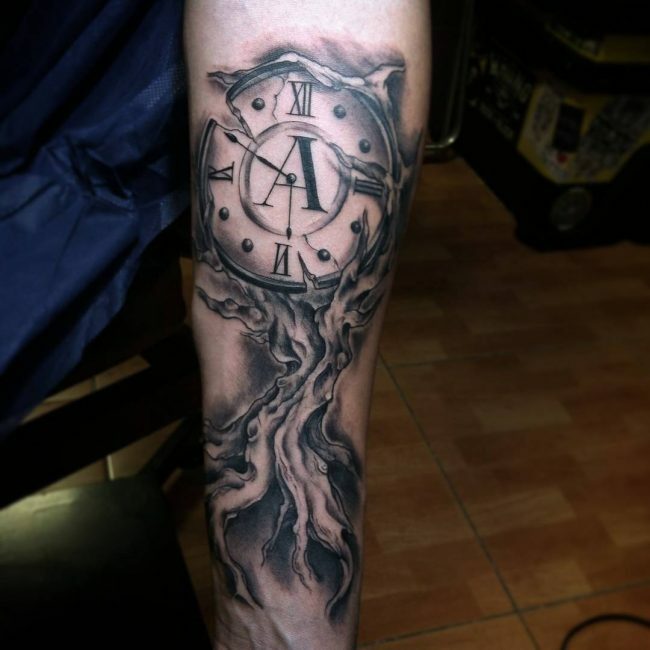 Other suitable places to have your tattoo include your forearm, side, ribs, hips, legs (thigh or calf), ankle or wrists. 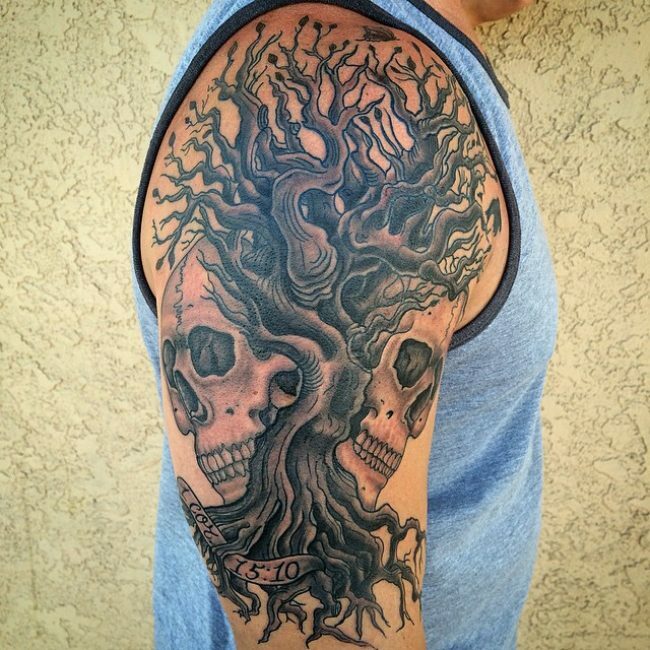 Getting a tattoo is permanent and can be a big commitment, but most have their own ways of approaching the concept. 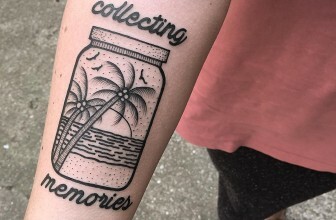 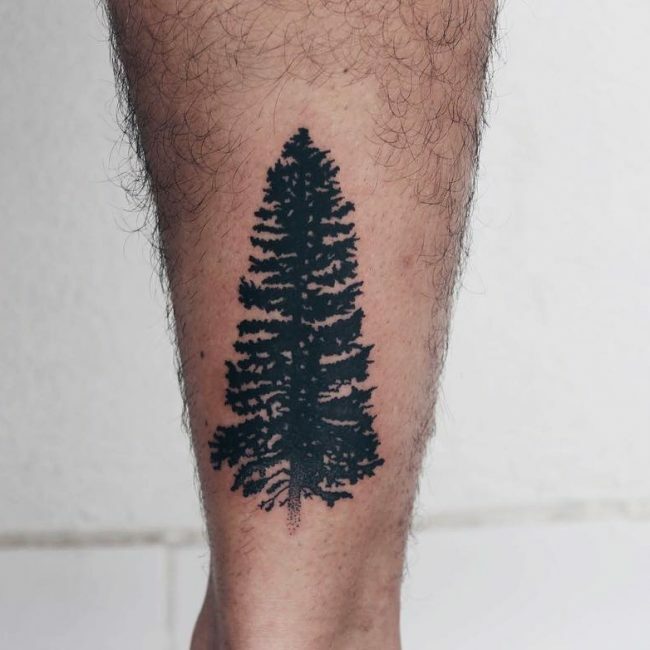 Some love the idea of something grabbing their fancy and getting it tattooed instantly while others follow popular tattoo trends. 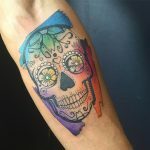 Some may spend time doing research and figuring out exactly what they really want, where they want it, and why they want it. 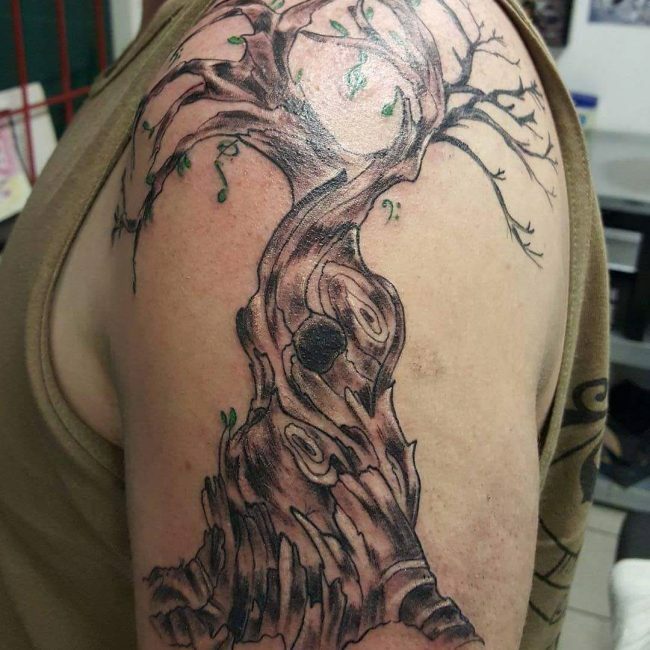 Your decision to get a tattoo should be thoroughly thought about. 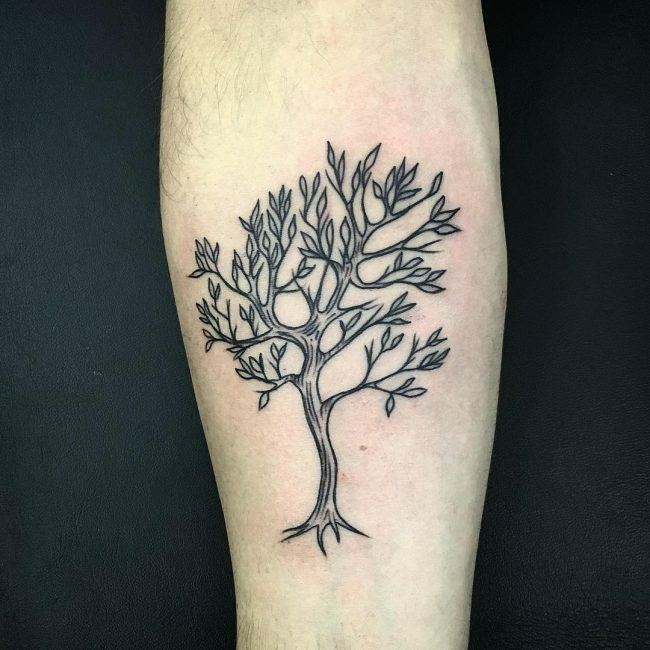 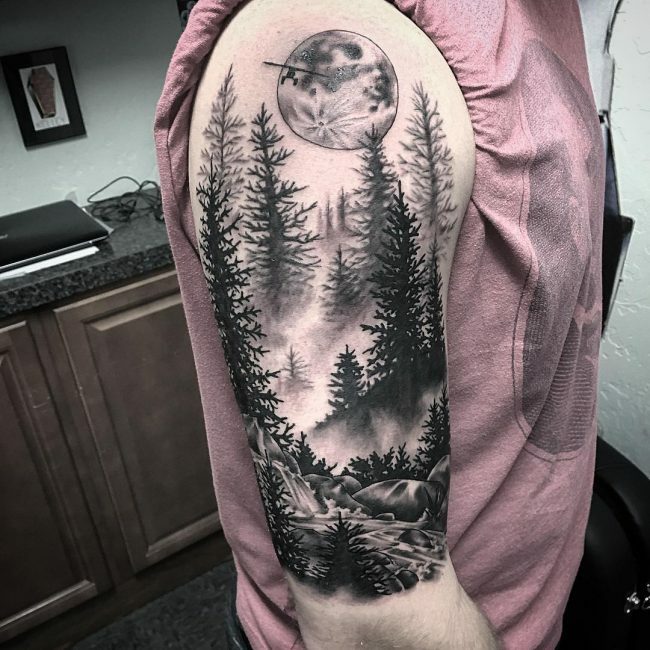 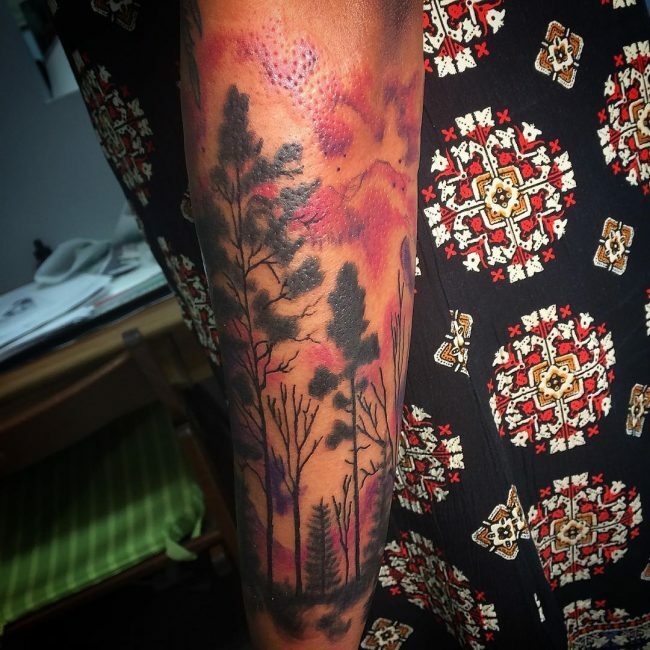 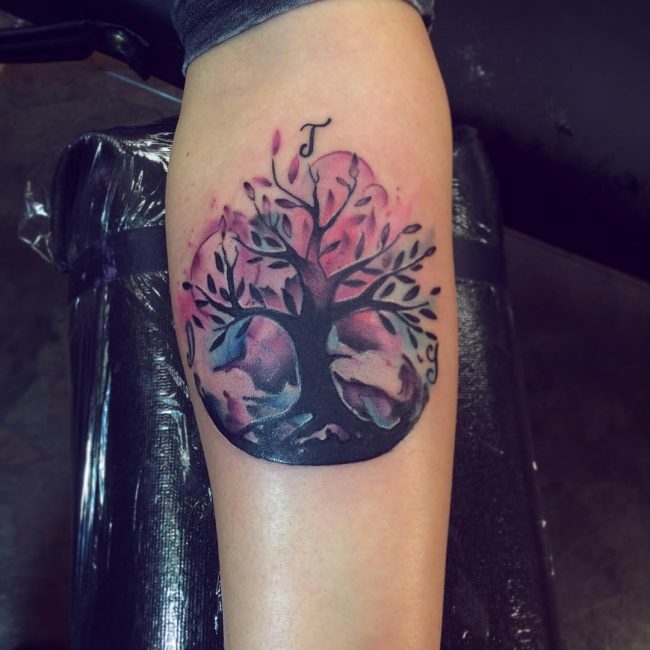 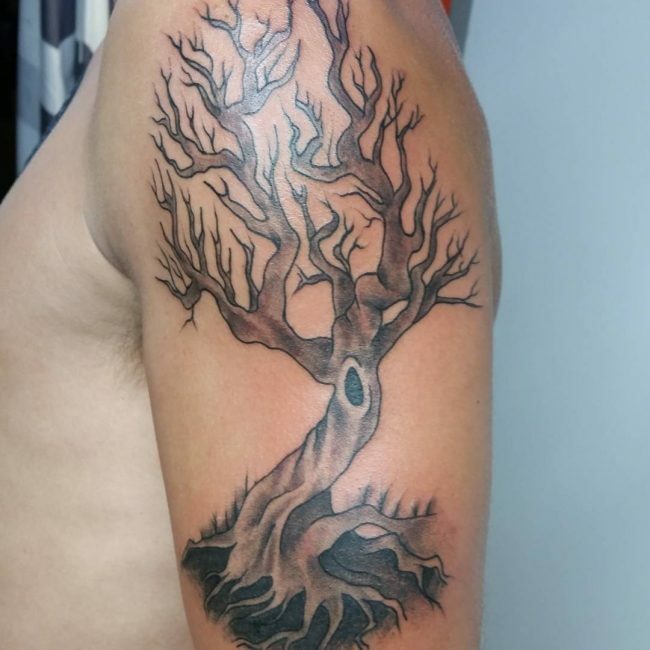 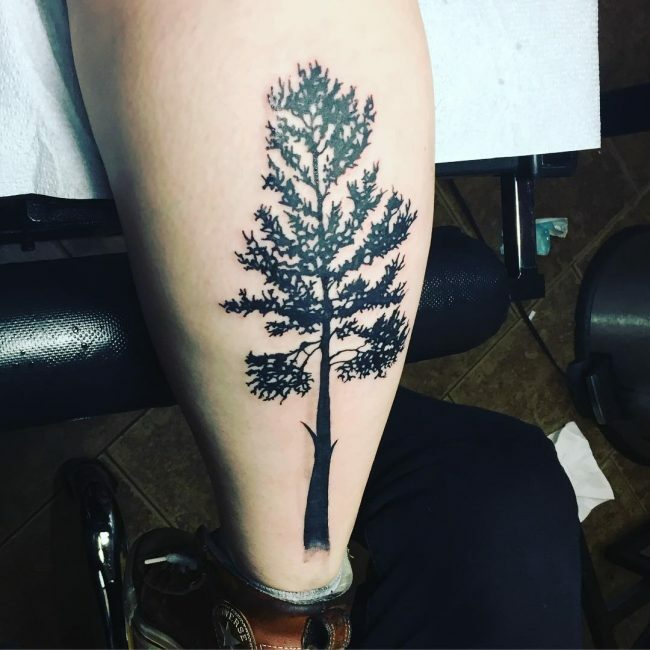 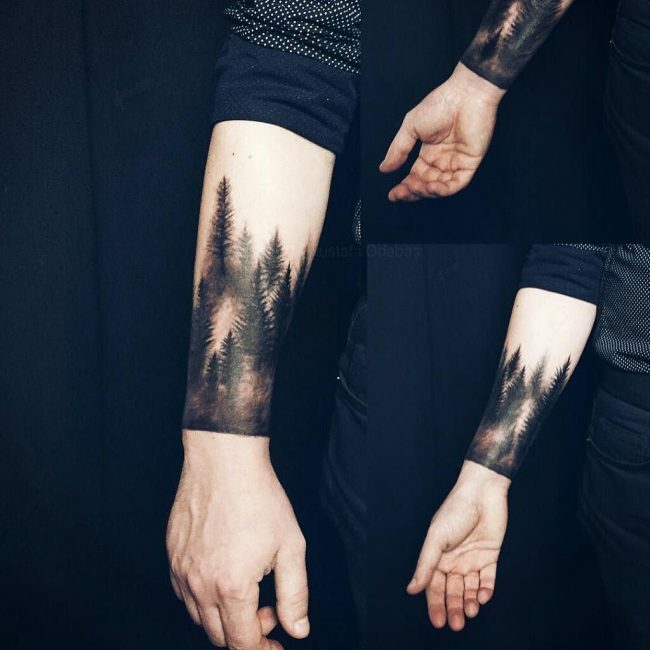 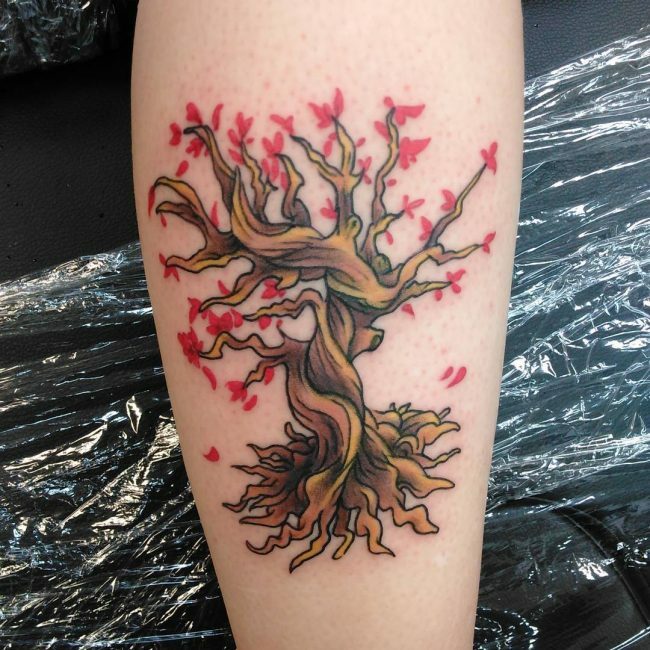 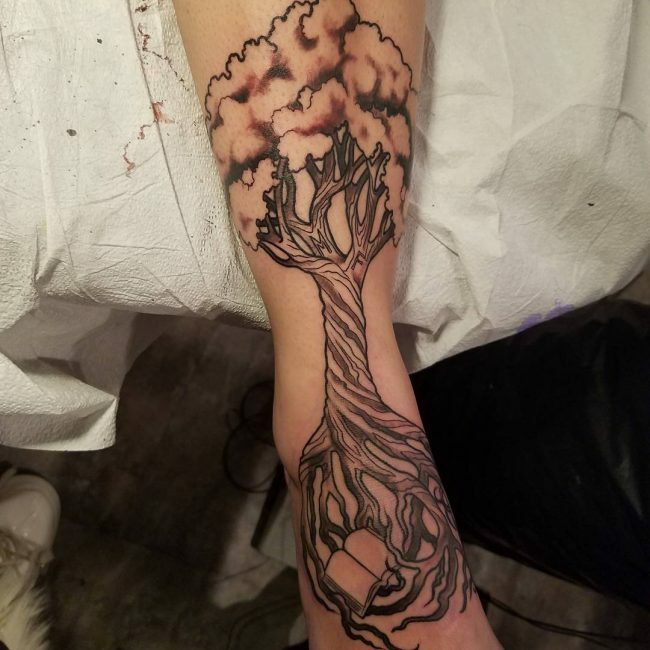 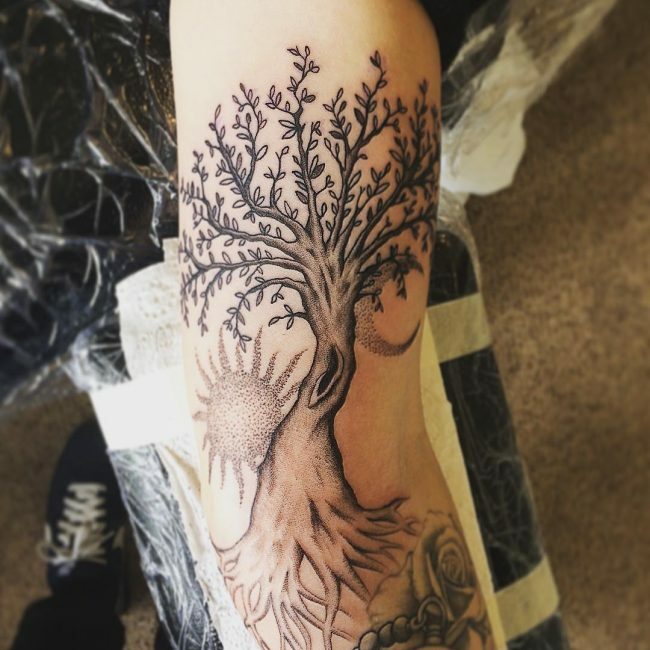 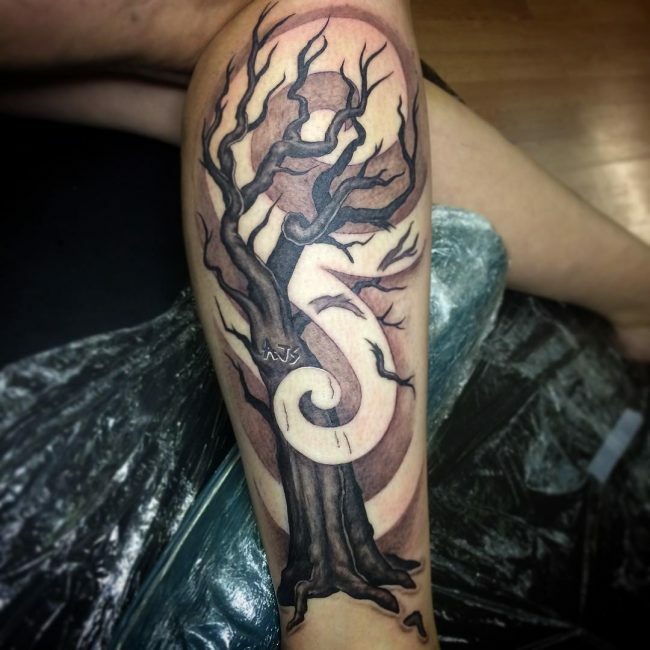 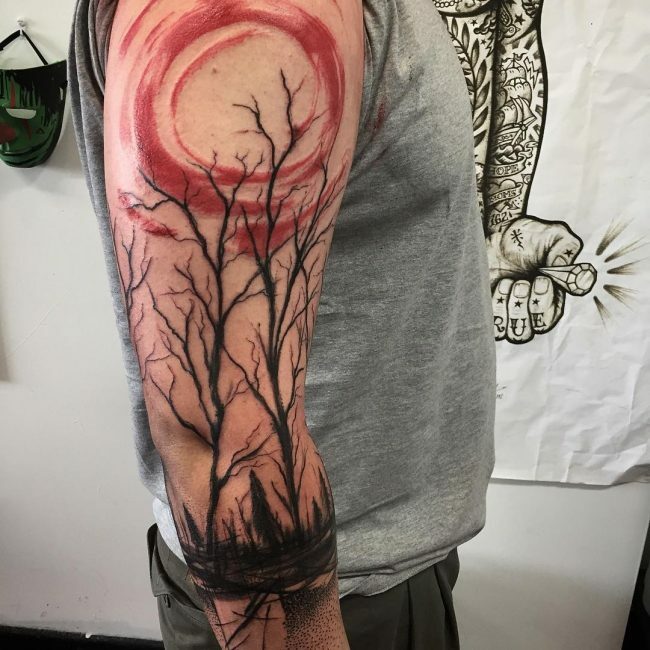 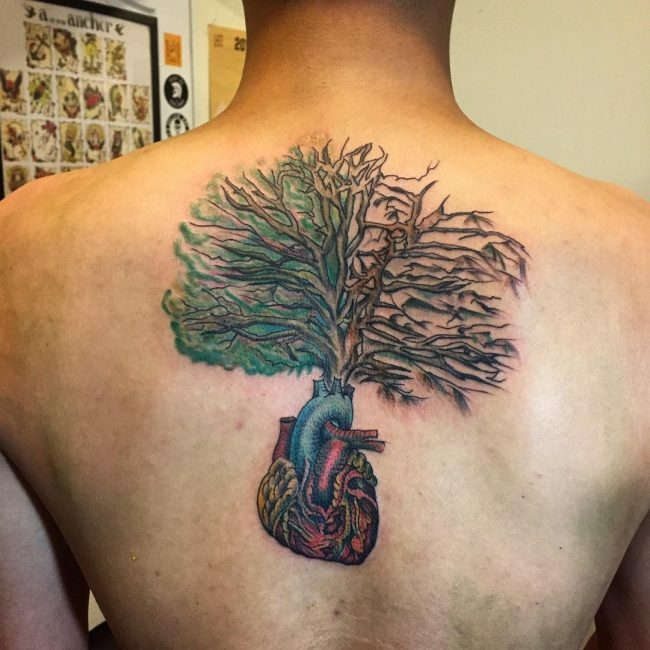 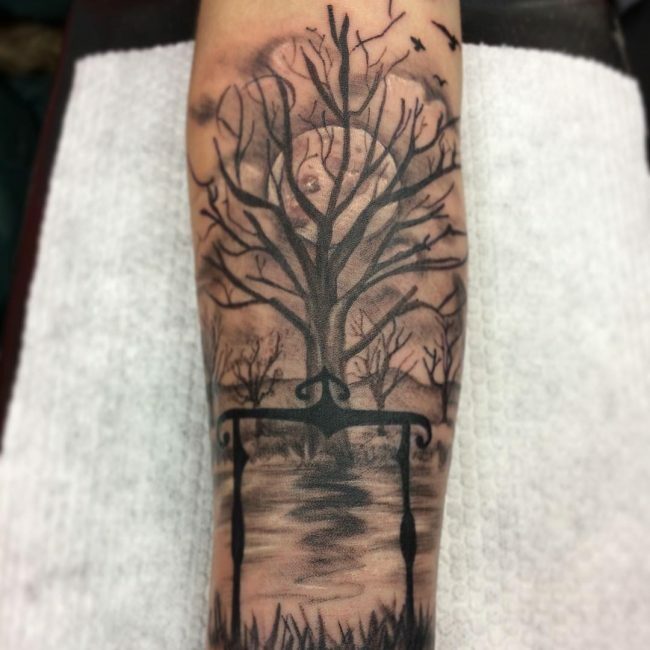 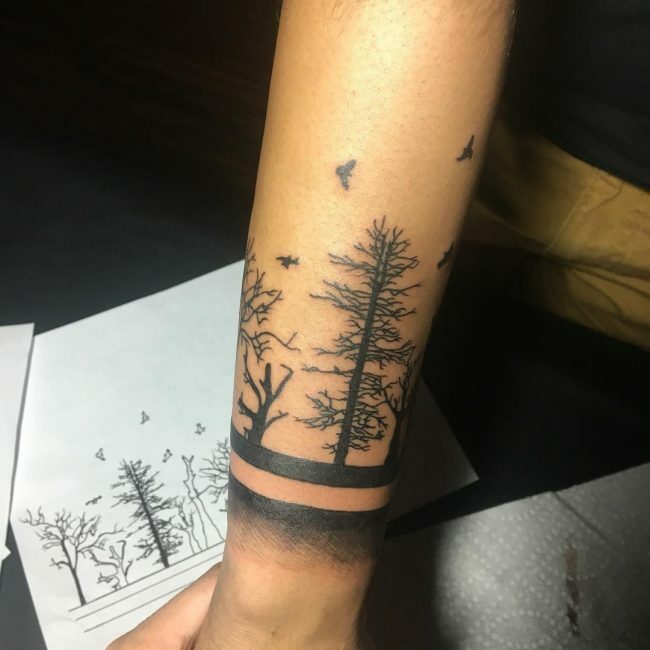 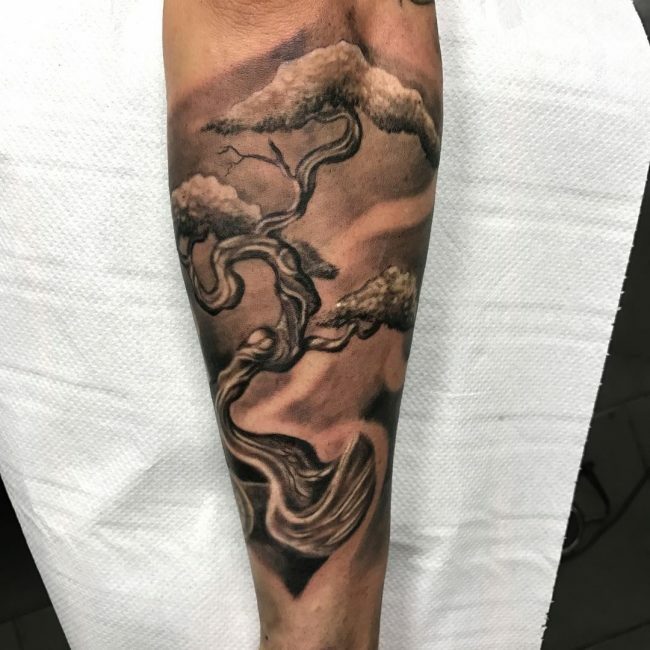 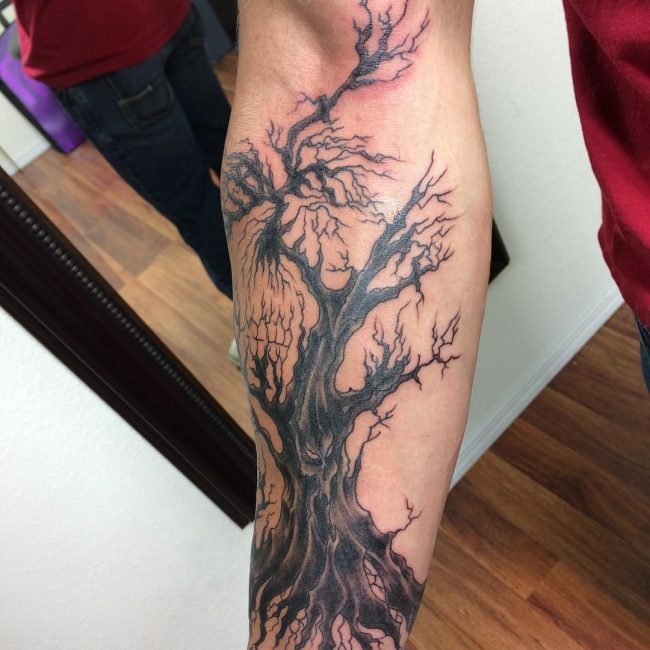 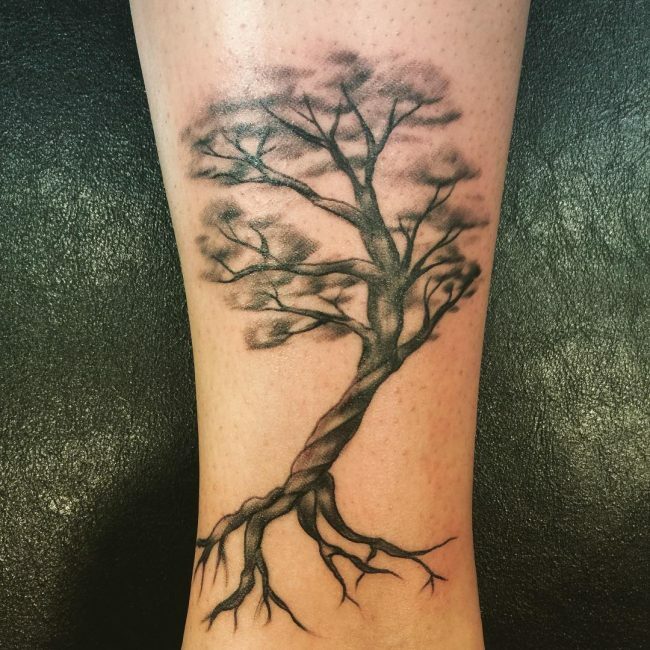 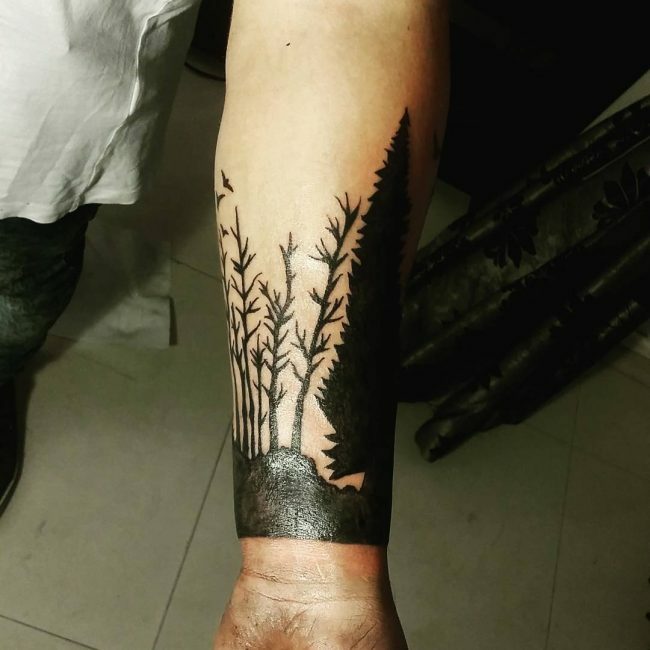 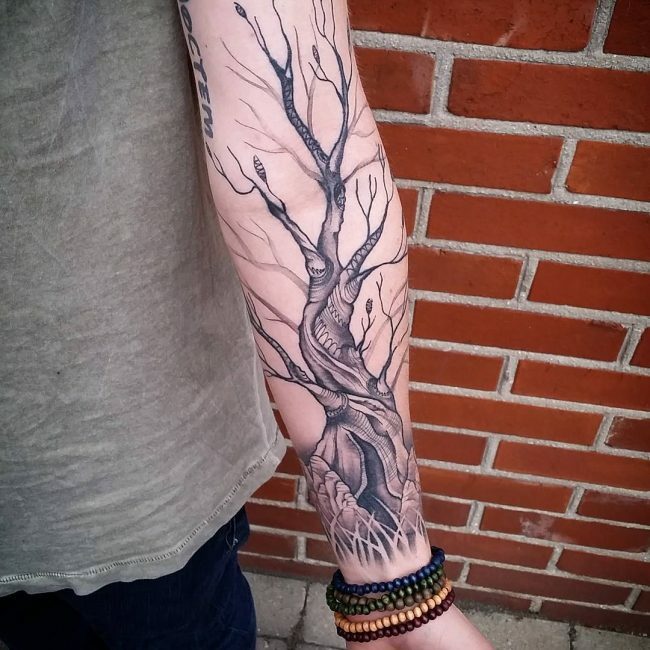 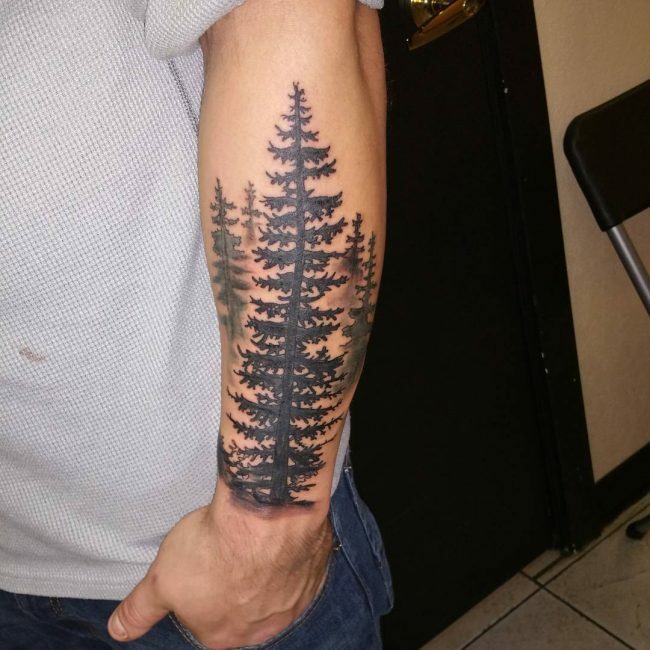 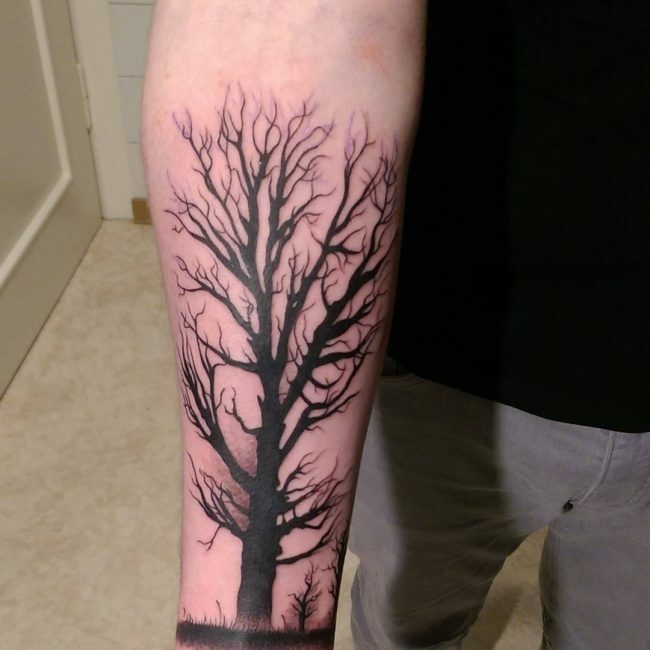 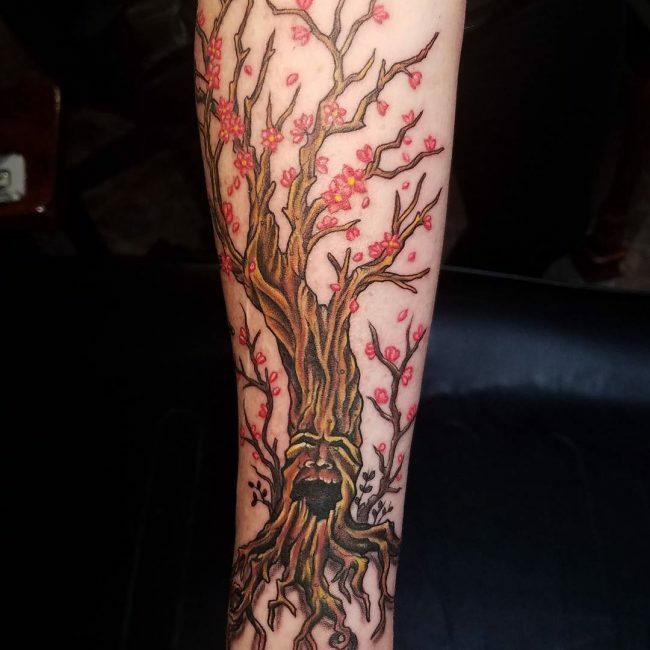 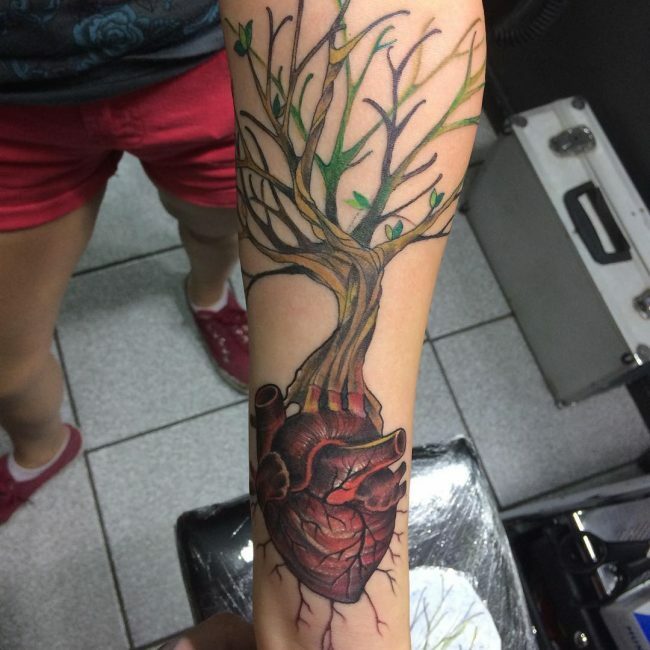 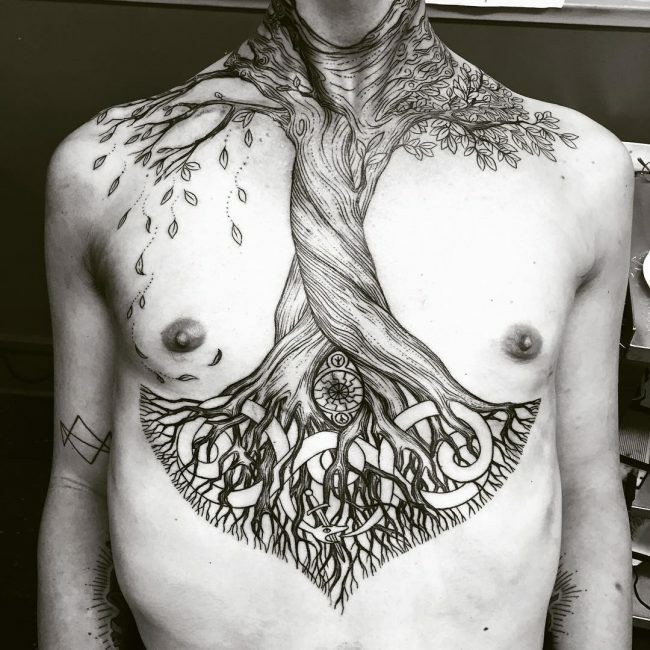 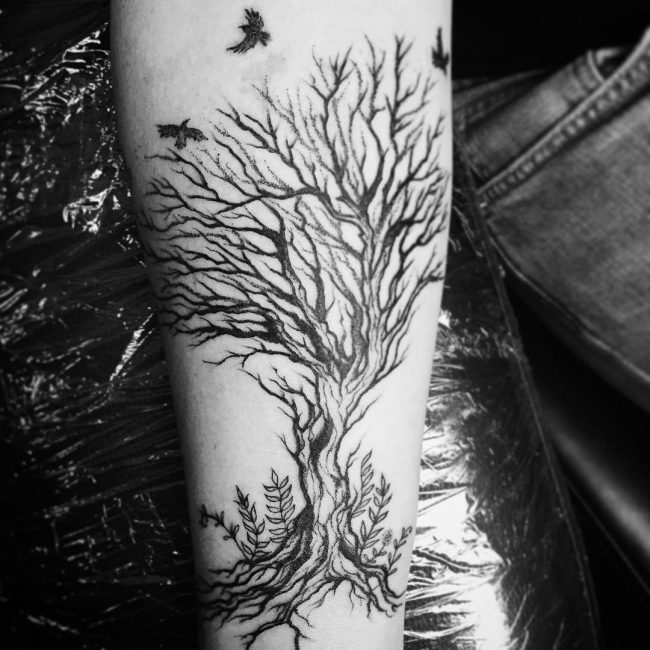 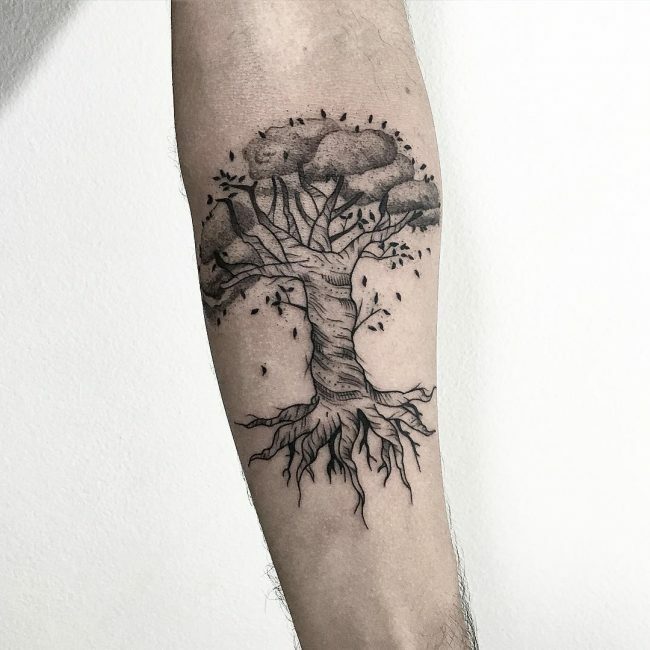 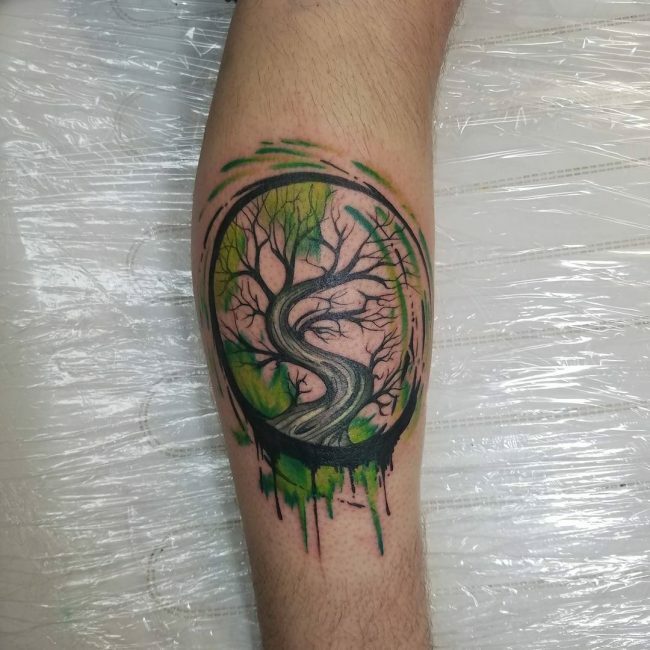 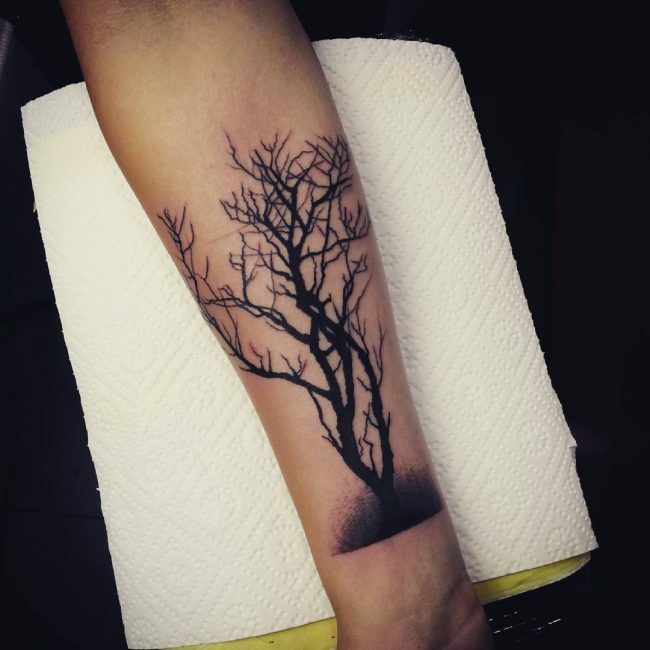 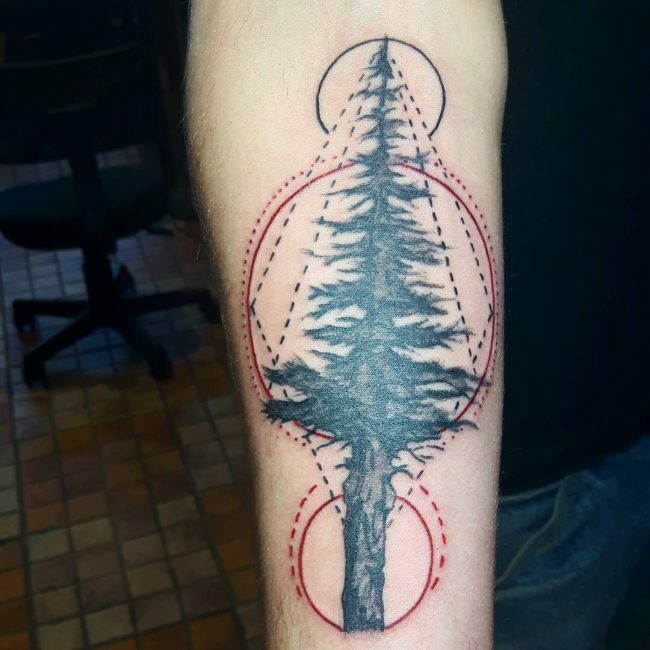 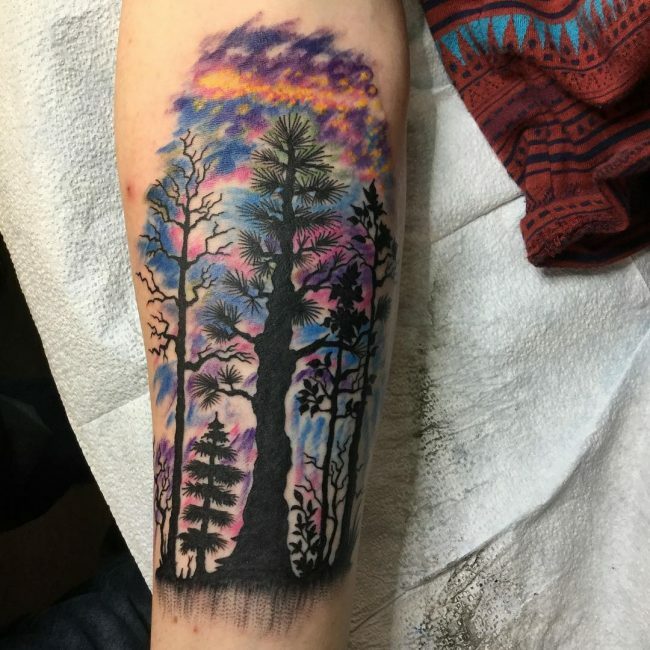 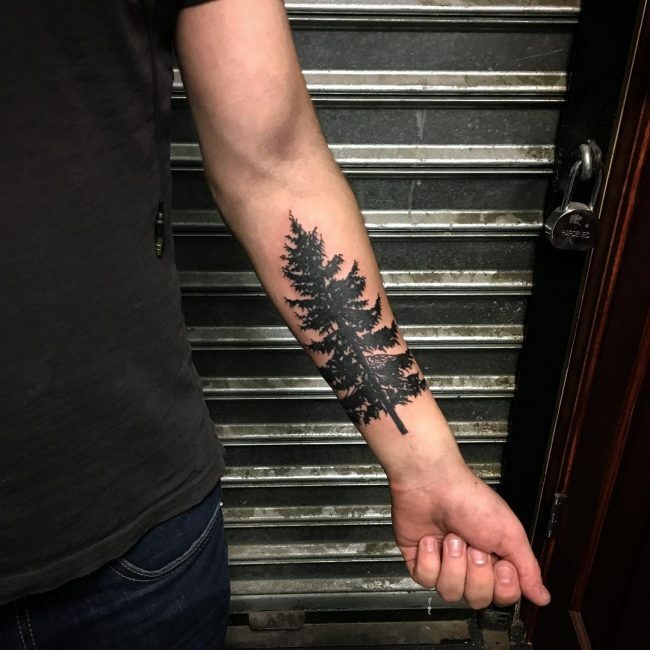 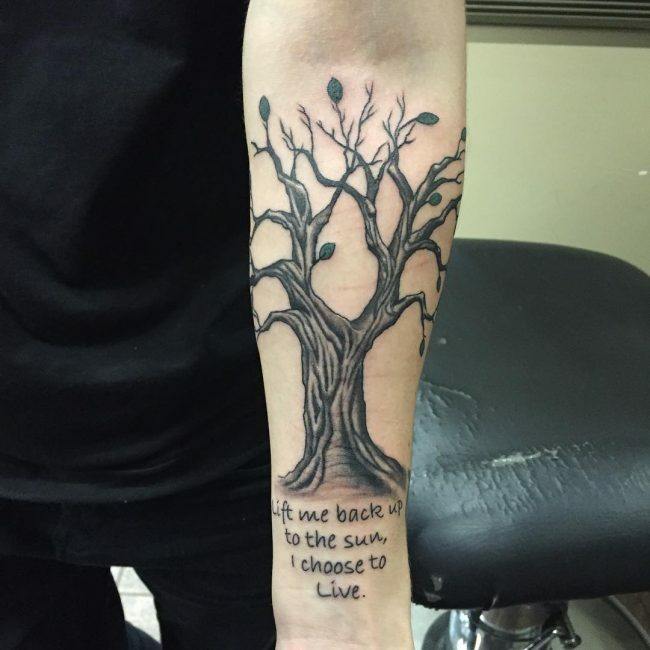 If you do decide to invest in a tattoo of a tree, it can be a fantastic way to symbolize your growth as a person and the stage you are at in your life, so give it a go!